The Warhammer 40,000 Dawn of War III guide contains all the information required to fully understand this title. Inside you can find a detailed walkthrough of all of the 17 missions of the single player campaign, as well as videos showing the completion process of each one of them. Additionally, the guide contains a thorough description of all of the factions available in the game – Space Marines, Eldars and Orks – coupled with their special traits, units, buildings and available doctrines. What is more, the text contains information about their playstyles, in every game mode available in the game, from the early minutes to the end of the match. 63 pages, 42 images, 13 videos. 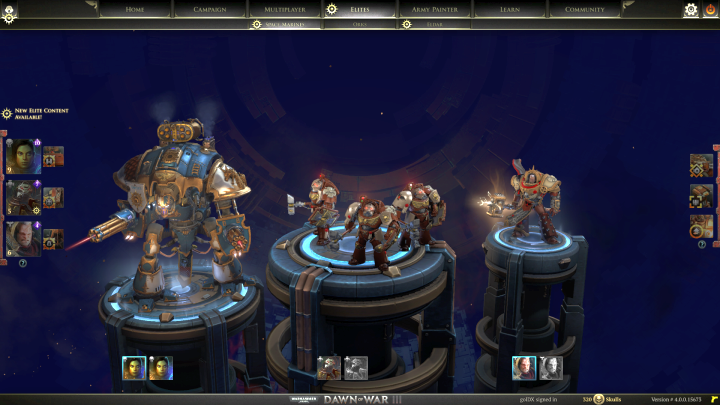 Mission 2 – Destined for Greater Fings Warhammer 40,000: Dawn of War III Guide. 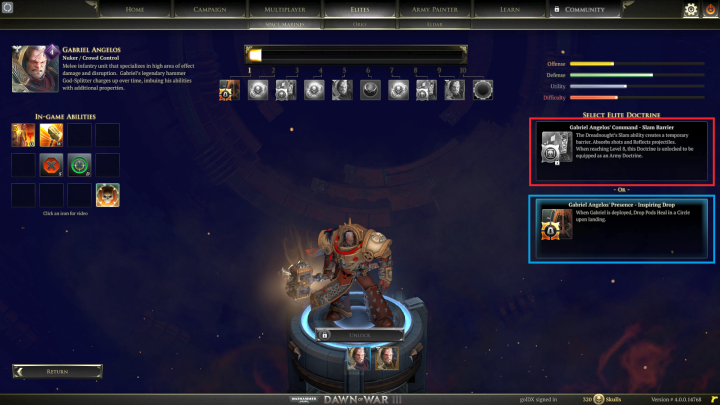 Mission 13 Warhammer 40,000: Dawn of War III Guide. 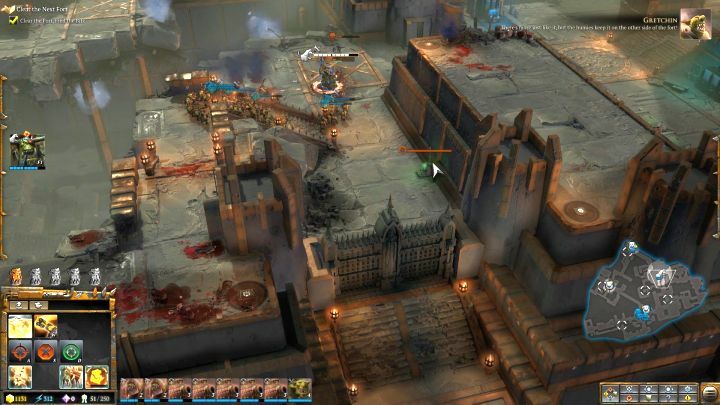 General tips for Dawn of War III Warhammer 40,000: Dawn of War III Guide. 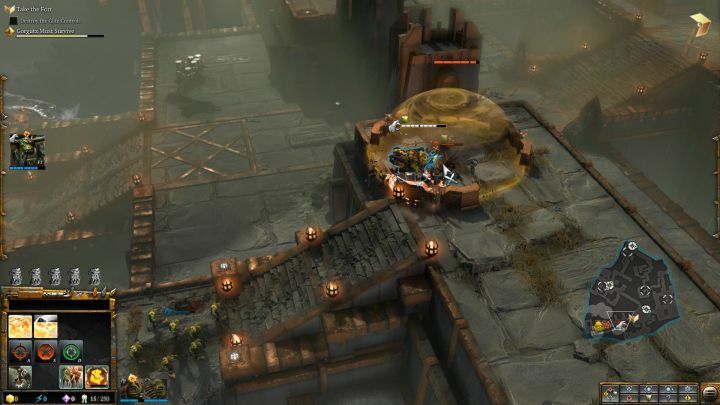 Warhammer 40.000: Dawn of War III is a real-time strategy game. 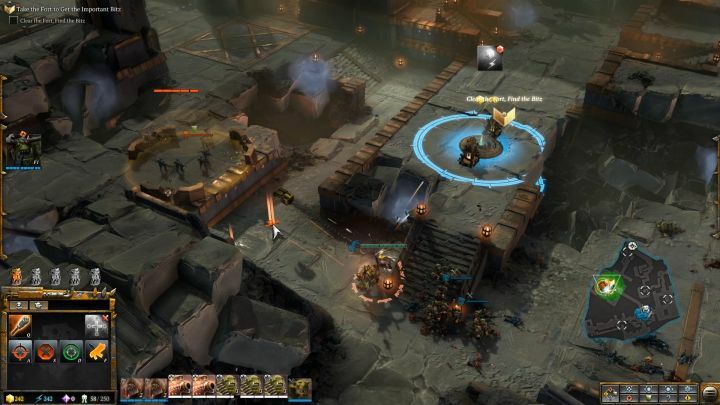 As the title suggests, the player is taken to a dark world of Warhammer 40.000, which emerged along with tabletop battle games released by Games Workshop. 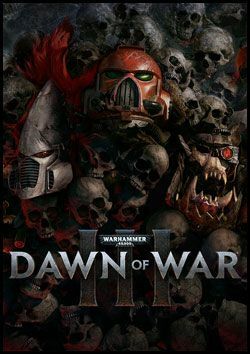 In Warhammer 40.000: Dawn of War III the story is centered around three factions, namely the Space Marines led by Gabriel Angelo and belonging to the Blood Ravens Chapter; the Eldar led to battle by a farseer named Macha and the Orcs ruled by Gorgutz – an iron-fist warlord. All the three groups invade Acheron, trying to reach a powerful weapon hidden on the planet. Relic Entertainment – Developer Website. Warhammer 40,000: Dawn of War III – Official Website. 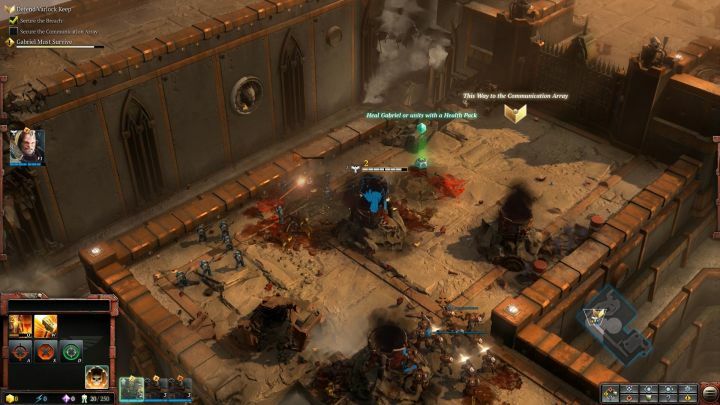 In this gameplay video Relic Entertainments presents the Space Marine faction – their elite heroes, units, and abilities. The video, first showed off at E3 2016, has now received a proper commentary. 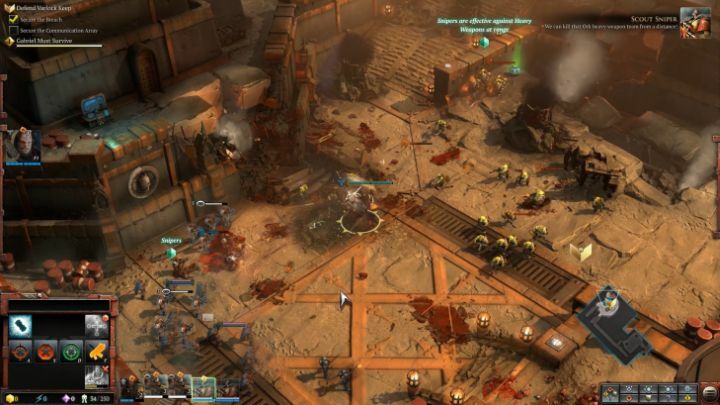 PC Gamer has revealed tons of new information on Warhammer 40,000: Dawn of War III, concerning mainly the available heroes, base development, and the cover system. 1. Monitor the situation on the battlefield! If you�ve noticed an enemy approaching your resource point with a small group of units, send a small force to chase them away. There�s no point to run around with the whole army from one place to another � you�ll lose time and the enemy can take the opportunity and strike you at a different place. 2. Sometimes it�s better to just let go of a certain resource point. If the enemy attacks a specific point with a huge army, and you don�t have an adequate strike force to defend it, ignore it and don�t engage the enemy in combat. The point can be recaptured later, but the potential loses you can suffer during an encounter might lose you the entire game. 3. Place Listening Posts on the resource points you�ve managed to capture. This is most important for the points situated deep into the battlefield, vulnerable to enemy attacks. It won�t allow them to protect themselves against a powerful army, but they can easily fend off a single squad and give you time to react when the enemy attacks. Selection of proper doctrines is crucial to your success. 4. Construct generators on the resource points you�ve captured. Generators are quite costly, especially during the first minutes of the match when the resources are scarce, but each one of them will increase the Requisition, Energy and Elite Points generation significantly. Additionally, the enemy will need to destroy those generators before capturing a point, giving you some time to react. 5. Don�t be passive! Don�t stay in the base and wait until you create your �perfect� army to attack the enemy. The enemy is recruiting units at the same time and it won�t change anything. Additionally, by staying at the base all the time you won�t have any idea what�s happening on the map, beyond the fog of war (where there are no allied units and you have no vision). 6. Check what your enemy is doing. If you�ve noticed that a majority of his/her army consists of light infantry, there�s no point in investing into units that will deal increased damage against heavily-armored units. If, in turn, the enemy focuses on melee-oriented units, you should invest in some of those as well, so that the enemy units won�t have a huge advantage over your own. If the enemy likes to hide his/her units under heavy cover, use squads that have the Counters Cover trait, allowing them to get under the protective bubble and eliminate the enemies hiding there. 7. Use Heavy Covers with caution. Those will give your units a powerful defensive boost, protecting them from enemy ranged attacks. However, squads staying under the protective bubble are extremely vulnerable to units with the Counters Cover trait. 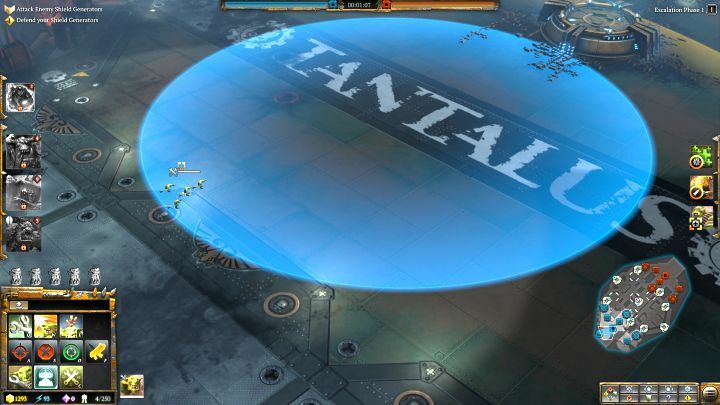 Normally, a unit won�t be able to get into the protective bubble created by the enemy army, but units with the mentioned trait can bypass it and enter those at will. Some units, like snipers, have no chances against an infantry squad specialized in melee combat. 8. Protect resource points that generate Elite Points. Elite Points are used to create elite units, and the more of them (points) you have, the faster you will be able to call in your elite units to the battlefield. Elite Point resource points are the only ones you have to keep an eye out for all the time � don�t let the enemy control them, otherwise they will call in powerful elite enemies and use them against you. 9. Use gates and bridges. You can find closed bridges and gates on some of the multiplayer maps. There�s always a console located right next to them. Destroying the console will cause the gate / bridge to open, allowing access. This in turn will give you (and your enemy) more opportunities, as you can attack them from a direction that they aren�t expecting an attack from. 10. Use Stealth Covers and bushes. Units that enter Stealth Covers and bushes become invisible to the nearby enemy units. They remain hidden until an enemy squad enters the same bush, or if they start shooting at an enemy. Use this mechanic to your advantage and prepare ambushes. 11. Remember that your units can move using two different commands. By clicking the RMB (Right Mouse Button) on a given area, your units will follow the command, moving towards the specified area, ignoring any enemy units along the way. However, you can also press A (or the appropriate button on the left side of the interface) and issue the movement command afterwards. In this case, the units will still move to the specified area, but they will engage any foes along the way. 12. Use terrain elevation to your advantage. If your units are located above the enemy ones, you will be able to see the enemy units, but the foe won�t be able to see yours, at least until they start attacking. This can be used similarly to Stealth Covers and bushes, to prepare ambushes for the unsuspecting enemy units travelling through the area. 13. Remember about escalation phases. The game is divided into phases, similarly to early / mid / late game from MOBA titles. During the first escalation phase you will receive 25% resources for every unit lost on the battlefield and the value decreases with each phase, finally falling down to 0%. However, higher escalation phases influence the amount of resources and the durability of shields and towers, increasing with each higher phase. The game always starts at the first escalation phase, increasing to higher each 10 minutes. 14. Escalation phases alter the game significantly � the gameplay during each one of them looks different. During the first minutes of the game, losing a single unit is a severe blow, which is why you should try and retreat it before it�s killed. As the game goes on, each player will have more resources and everyone will simply have more units to use on the battlefield, making potential loses less severe. 15. Each online game goes by the same scenario. You have to destroy the enemy shield (or two of them), then take out the turret (or two of them) to finish them game by destroying the core. You should try to destroy the enemy shield as early as possible, as it will give your entire team a huge resource boost, giving you an advantage over the enemy during the rest of the game. 16. 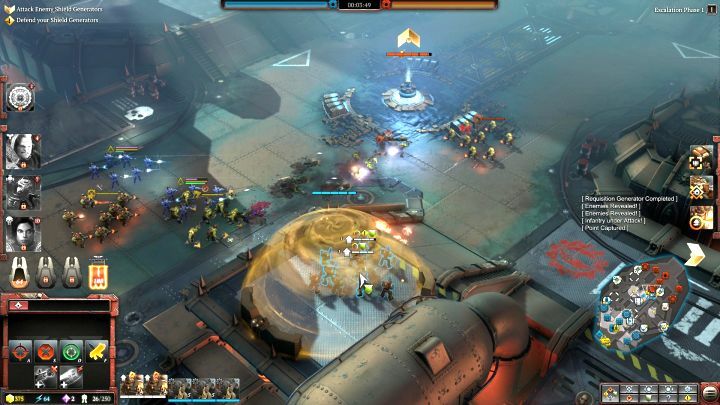 While planning an attack on the enemy turret, try not to move your army in a tight formation. Turrets deal considerable damage, attacking units in a straight line � you should try to scatter them, decreasing the potential loses. 17. As your army grows, the upkeep costs will also increase. This works similarly to the mechanic found in Warcraft 3 � when you only have a small amount of units, you won�t suffer any consequences, but as your army grows, you will generate less and less resources per minute. 18. Protect your elite units and prevent them from dying. You can summon them again even after they are killed in combat, but each death increases the respawn time � the more often a unit will die on the battlefield, the longer you will have to wait until you can summon it again. Try to take them out of the battlefield before they die and send them near building to heal them. 19. Use the appropriate doctrines to go along with your playstyle. Thanks to that, units will gain new abilities and some of them might even function differently. 1. The army of Orks can be compared to Zergs from the Starcraft franchise. Their squads are more numerous when compared to other factions (although it’s not that extreme as in the first Dawn of War game. However, this comes at a price – they have lower durability than the remaining factions, especially the most basic squad of the Orks. 2. This faction uses one of the most unique mechanics in the entire game: Loot. Thanks to that, every unit, even an elite one, can pick up Scrap lying somewhere on the battlefield. Doing so enhances the unit. In most cases this gives them an additional ability – throwing grenades, creating protective shields that increase the movement of the unit as well, or by enhancing the abilities that the unit already had. 3. Loot is the crucial element of the gameplay of that faction. “Unupgraded” units of Orks are relatively weak (especially when compared to their enhanced, Scrap-wielding versions) and will, generally, lose to similar units of other factions. However, this changes when they are equipped with Scrap, allowing them to fight on par, or even be more effective. This is why you should always try to equip all of your units with this precious resource. Ork troops are characterized by their numbers. 4. Salvage is another special ability of Orks. This is an ability available to the Ork buildings, Gretchin. With it, Gretchin can quickly turn Salvage into vehicles and constructs, or even Waaagh! Towers. Additionally, constructing units with the use of Salvage is a lot cheaper than normal recruitment. 5. Remember that Salvage has its requirements. You need to find Scrap of suitable size and you have to construct all the buildings that are normally used to recruit the units that you want to construct with the Salvage ability. 6. Scrap, the material used to upgrade units and to construct units with the Salvage ability, comes in variety of sizes. The smallest one allows you to upgrade a single unit, but you can’t use it to create a vehicle/walker with the Salvage ability. Biggest Scraps allow you to upgrade more than a single unit and can be used with the Salvage ability – Scrap of moderate size will give access to a portion of units, whereas the large one to all of them. 7. Scrap is generated from a number of sources. The easiest way to gain it is to use a Waaagh! Tower. Each tower generates Scrap after a specific time has passed. As the game goes on (higher escalation phases), towers will generate bigger Scraps. Additionally, Scrap can also be acquired from destroyed enemy vehicles and walkers – the bigger (and more expensive) the unit, the bigger the Scrap left behind. 8. Orks, in contrast to Eldars and Space Marines, can’t upgrade the main building to gain access to new technologies. Instead, they use Waaagh Towers. Each tower you construct increases the tech level by 1 and to unlock all of the units and upgrades available to the Orks, you need to get to level 5. 10. Waaagh Towers are associated with one more thing – buffing your units. Each one of them gives access to Waaagh ability, which, after several seconds, creases a WAAAAAAAGH!!!!! battlecry. Once it happens, it hypes all the nearby Ork units, giving them a temporary buff to attack speed and damage. The buff lasts for several seconds, increased by 15s after upgrading the ability. 11. Additionally, WAAAAAAAGH!!!!! replenishes a portion of health and restores squad numbers of your units that were affected by the battlecry. Keep in mind that you need to have Gorgutz deployed on the battlefield for the healing effect to be present – otherwise it won’t work. 12. Remember – despite the fact that WAAAAAAAGH!!!!! allows you to replenish your units for free, the ability needs several seconds to start (and several minutes to get off cooldown). 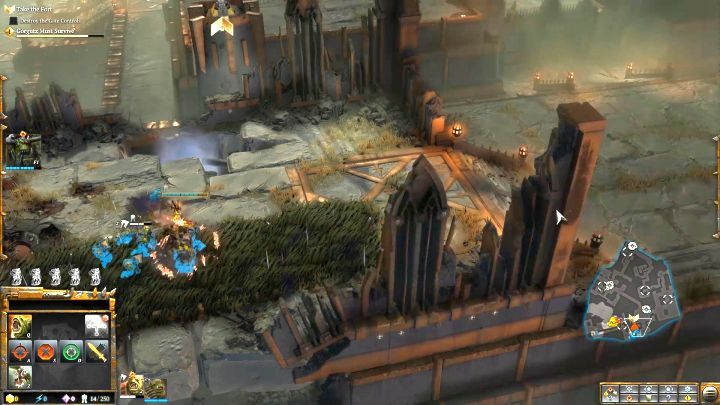 Additionally, during the “loading sequence” of the battlecry, the tower will be visible on the mini-map. 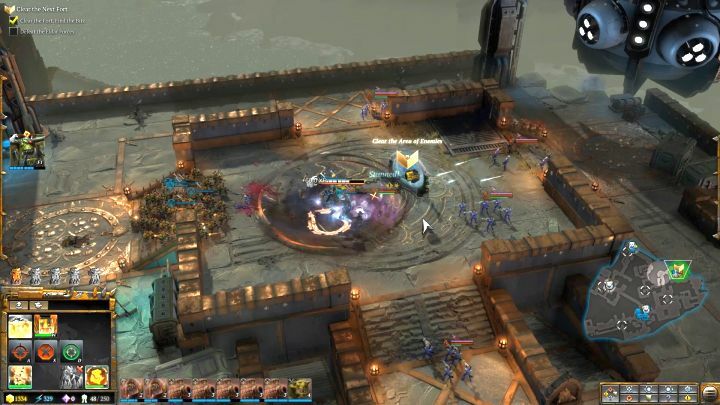 This gives the enemy team an opportunity to react – they might learn the position of your forces, send an army there to attack you, or reveal the location with a single unit and use superweapon to deal damage. Additionally, while the WAAAAAAAGH!!!!! effect is charging, the WAAAGH Tower takes increased damage from enemy attacks. Use this method as a health replenishment with care. 13. Roks is the Super Ability of the Orks. Once activated, a tractor beam appears in the speficied area. It will follow the first unit you order it to follow, be it an enemy or an ally. While it remains active, it deals damage to nearby enemies, expanding at the same time. After several seconds, a huge rock falls down on the tractor beam, dealing immense damage to all enemy units and buildings in the impact area. This ability is extremely effective against units that are cramped together – the enemy won’t be able to locate the unit that the tractor beam is following, making it hard for him/her to decrease the casualties. 14. While using the Roks Super Ability you must remember to not target an enemy with low health with it. If the enemy unit that the tractor beam was following is killed, the beam will stop following anyone, becoming completely useless. There are 81 achievements available in Warhammer 40,000 Dawn of War III. In this chapter you will find a complete list, as well as the methods to acquire them. Requirements: Complete The Defense of Varlock Keep mission on Casual Difficulty. Description: You will receive this achievement for completing the first mission of the campaign on the Casual Difficulty. Requirements: Complete The Defense of Varlock Keep mission on Normal Difficulty. Description: You will receive this achievement for completing the first mission of the campaign on the Normal Difficulty. Requirements: Complete The Defense of Varlock Keep mission on Hard Difficulty. Description: You will receive this achievement for completing the first mission of the campaign on the Hard Difficulty. Requirements: Complete Destined For Greater Fings mission on Casual Difficulty. Description: You will receive this achievement for completing the second mission of the campaign on the Casual Difficulty. Requirements: Complete Destined For Greater Fings mission on Normal Difficulty. Description: You will receive this achievement for completing the second mission of the campaign on the Normal Difficulty. Requirements: Complete Destined For Greater Fings mission on Hard Difficulty. Description: You will receive this achievement for completing the second mission of the campaign on the Hard Difficulty. Requirements: Complete Beware False Profits mission on Casual Difficulty. Description: You will receive this achievement for completing the third mission of the campaign on the Casual Difficulty. Requirements: Complete Beware False Profits mission on Normal Difficulty. Description: You will receive this achievement for completing the third mission of the campaign on the Normal Difficulty. Requirements: Complete Beware False Profits mission on Hard Difficulty. Description: You will receive this achievement for completing the third mission of the campaign on the Hard Difficulty. Requirements: Complete In Defense of Loyalty mission on Casual Difficulty. Description: You will receive this achievement for completing the fourth mission of the campaign on the Casual Difficulty. Requirements: Complete In Defense of Loyalty mission on Normal Difficulty. Description: You will receive this achievement for completing the fourth mission of the campaign on the Normal Difficulty. Requirements: Complete In Defense of Loyalty mission on Hard Difficulty. Description: You will receive this achievement for completing the fourth mission of the campaign on the Hard Difficulty. Requirements: Complete The Social Climber mission on Casual Difficulty. Description: You will receive this achievement for completing the fifth mission of the campaign on the Casual Difficulty. Requirements: Complete The Social Climber mission on Normal Difficulty. Description: You will receive this achievement for completing the fifth mission of the campaign on the Normal Difficulty. Requirements: Complete The Social Climber mission on Hard Difficulty. Description: You will receive this achievement for completing the fifth mission of the campaign on the Hard Difficulty. Requirements: Complete A Dangerous Proposal mission on Casual Difficulty. Description: You will receive this achievement for completing the sixth mission of the campaign on the Casual Difficulty. Requirements: Complete A Dangerous Proposal mission on Normal Difficulty. Description: You will receive this achievement for completing the sixth mission of the campaign on the Normal Difficulty. Requirements: Complete A Dangerous Proposal mission on Hard Difficulty. Description: You will receive this achievement for completing the sixth mission of the campaign on the Hard Difficulty. Requirements: Complete The Dark Arrival mission on Casual Difficulty. Description: You will receive this achievement for completing the seventh mission of the campaign on the Casual Difficulty. Requirements: Complete The Dark Arrival mission on Normal Difficulty. Description: You will receive this achievement for completing the seventh mission of the campaign on the Normal Difficulty. Requirements: Complete The Dark Arrival mission on Hard Difficulty. Description: You will receive this achievement for completing the seventh mission of the campaign on the Hard Difficulty. Requirements: Complete None Left Behind mission on Casual Difficulty. Description: You will receive this achievement for completing the eight mission of the campaign on the Casual Difficulty. Requirements: Complete None Left Behind mission on Normal Difficulty. Description: You will receive this achievement for completing the eight mission of the campaign on the Normal Difficulty. Requirements: Complete None Left Behind mission on Hard Difficulty. Description: You will receive this achievement for completing the eight mission of the campaign on the Hard Difficulty. Requirements: Complete The Seer, The Trickster and The Brute mission on Casual Difficulty. Description: You will receive this achievement for completing the ninth mission of the campaign on the Casual Difficulty. Requirements: Complete The Seer, The Trickster and The Brute mission on Normal Difficulty. Description: You will receive this achievement for completing the ninth mission of the campaign on the Normal Difficulty. Requirements: Complete The Seer, The Trickster and The Brute mission on Hard Difficulty. Description: You will receive this achievement for completing the ninth mission of the campaign on the Hard Difficulty. Requirements: Complete Cunning and Wiles mission on Casual Difficulty. Description: You will receive this achievement for completing the tenth mission of the campaign on the Casual Difficulty. Requirements: Complete Cunning and Wiles mission on Normal Difficulty. Description: You will receive this achievement for completing the tenth mission of the campaign on the Normal Difficulty. Requirements: Complete Cunning and Wiles mission on Hard Difficulty. Description: You will receive this achievement for completing the tenth mission of the campaign on the Hard Difficulty. Requirements: Complete The Bloody Gambit mission on Casual Difficulty. Description: You will receive this achievement for completing the eleventh mission of the campaign on the Casual Difficulty. Requirements: Complete The Bloody Gambit mission on Normal Difficulty. Description: You will receive this achievement for completing the eleventh mission of the campaign on the Normal Difficulty. Requirements: Complete The Bloody Gambit mission on Hard Difficulty. Description: You will receive this achievement for completing the eleventh mission of the campaign on the Hard Difficulty. Requirements: Complete Chasing Beauty mission on Casual Difficulty. Description: You will receive this achievement for completing the twelfth mission of the campaign on the Casual Difficulty. Requirements: Complete Chasing Beauty mission on Normal Difficulty. Description: You will receive this achievement for completing the twelfth mission of the campaign on the Normal Difficulty. Requirements: Complete Chasing Beauty mission on Hard Difficulty. Description: You will receive this achievement for completing the twelfth mission of the campaign on the Hard Difficulty. Requirements: Complete Waking Giants mission on Casual Difficulty. Description: You will receive this achievement for completing the thirteenth mission of the campaign on the Casual Difficulty. Requirements: Complete Waking Giants mission on Normal Difficulty. Description: You will receive this achievement for completing the thirteenth mission of the campaign on the Normal Difficulty. Requirements: Complete Waking Giants mission on Hard Difficulty. Description: You will receive this achievement for completing the thirteenth mission of the campaign on the Hard Difficulty. Requirements: Complete In The Company of Friends mission on Casual Difficulty. Description: You will receive this achievement for completing the fourteenth mission of the campaign on the Casual Difficulty. Requirements: Complete In The Company of Friends mission on Normal Difficulty. Description: You will receive this achievement for completing the fourteenth mission of the campaign on the Normal Difficulty. Requirements: Complete In The Company of Friends mission on Hard Difficulty. Description: You will receive this achievement for completing the fourteenth mission of the campaign on the Hard Difficulty. Requirements: Complete A Clash of Leviathans mission on Casual Difficulty. Description: You will receive this achievement for completing the fifteenth mission of the campaign on the Casual Difficulty. Requirements: Complete A Clash of Leviathans mission on Normal Difficulty. Description: You will receive this achievement for completing the fifteenth mission of the campaign on the Normal Difficulty. Requirements: Complete A Clash of Leviathans mission on Hard Difficulty. Description: You will receive this achievement for completing the fifteenth mission of the campaign on the Hard Difficulty. Requirements: Complete The Storm Prince mission on Casual Difficulty. Description: You will receive this achievement for completing the sixteenth mission of the campaign on the Casual Difficulty. Requirements: Complete The Storm Prince mission on Normal Difficulty. Description: You will receive this achievement for completing the sixteenth mission of the campaign on the Normal Difficulty. Requirements: Complete The Storm Prince mission on Hard Difficulty. Description: You will receive this achievement for completing the sixteenth mission of the campaign on the Hard Difficulty. Requirements: Complete The Wayfarers mission on Casual Difficulty. Description: You will receive this achievement for completing the seventeenth mission of the campaign on the Casual Difficulty. Requirements: Complete The Wayfarers mission on Normal Difficulty. Description: You will receive this achievement for completing the seventeenth mission of the campaign on the Normal Difficulty. Requirements: Complete The Wayfarers mission on Hard Difficulty. Description: You will receive this achievement for completing the seventeenth mission of the campaign on the Hard Difficulty. Requirements: Great job! You completed the entire campaign on Casual Difficulty. Description: You need to complete all 17 missions of the singleplayer campaign on Casual Difficulty. Requirements: You’ve put your knowledge into practice and conquered the campaign on Normal Difficulty. Congratulations! Description: You need to complete all 17 missions of the singleplayer campaign on Normal Difficulty. Requirements: You’ve conquered our strongest challenge and completed the Campaign in Hard Difficulty. Great job! Description: You need to complete all 17 missions of the singleplayer campaign on Hard Difficulty. Requirements: Level-up Elite to the max. Great job! Description: To get this achievement, you must advance Imperial Knight Solaria to level 10. This can be done by playing through the campaign and using this elite in multiplayer matches. Description: To get this achievement, you must advance Gabriel Angelos to level 10. This can be done by playing through the campaign and using this elite in multiplayer matches. Description: To get this achievement, you must advance Kill Team Ironmaw to level 10. This can be done by playing through the campaign and using this elite in multiplayer matches. Description: To get this achievement, you must advance Terminators to level 10. This can be done by playing through the campaign and using this elite in multiplayer matches. Description: To get this achievement, you must advance Assault Terminators to level 10. This can be done by playing through the campaign and using this elite in multiplayer matches. Description: To get this achievement, you must advance Librarian Jonah Orion to level 10. This can be done by playing through the campaign and using this elite in multiplayer matches. Description: To get this achievement, you must advance Chaplain Diomedes to level 10. This can be done by playing through the campaign and using this elite in multiplayer matches. Description: To get this achievement, you must advance Venerable Dreadnought to level 10. This can be done by playing through the campaign and using this elite in multiplayer matches. Description: To get this achievement, you must advance Imperial Knight Paladin to level 10. This can be done by playing through the campaign and using this elite in multiplayer matches. Description: To get this achievement, you must advance Mad Dread to level 10. This can be done by playing through the campaign and using this elite in multiplayer matches. Description: To get this achievement, you must advance Big Mek Wazmakka to level 10. This can be done by playing through the campaign and using this elite in multiplayer matches. Description: To get this achievement, you must advance Weirdboy Zappnoggin to level 10. This can be done by playing through the campaign and using this elite in multiplayer matches. Description: To get this achievement, you must advance Meganobz to level 10. This can be done by playing through the campaign and using this elite in multiplayer matches. Description: To get this achievement, you must advance Stormboyz to level 10. This can be done by playing through the campaign and using this elite in multiplayer matches. Description: To get this achievement, you must advance Gorkanaut to level 10. This can be done by playing through the campaign and using this elite in multiplayer matches. Description: To get this achievement, you must advance Beauty Da Morkanaut to level 10. This can be done by playing through the campaign and using this elite in multiplayer matches. Description: To get this achievement, you must advance Da Kommando to level 10. This can be done by playing through the campaign and using this elite in multiplayer matches. Description: To get this achievement, you must advance Warboss Gorgutz to level 10. This can be done by playing through the campaign and using this elite in multiplayer matches. Description: To get this achievement, you must advance Wraithknight to level 10. This can be done by playing through the campaign and using this elite in multiplayer matches. Description: To get this achievement, you must advance Warp Spiders to level 10. This can be done by playing through the campaign and using this elite in multiplayer matches. Description: To get this achievement, you must advance Striking Scorpions to level 10. This can be done by playing through the campaign and using this elite in multiplayer matches. Description: To get this achievement, you must advance Wraithknight Taldeer to level 10. This can be done by playing through the campaign and using this elite in multiplayer matches. Description: To get this achievement, you must advance Jain Zar to level 10. This can be done by playing through the campaign and using this elite in multiplayer matches. Description: To get this achievement, you must advance Ranger Ronahn to level 10. This can be done by playing through the campaign and using this elite in multiplayer matches. Description: To get this achievement, you must advance Farseer Macha to level 10. This can be done by playing through the campaign and using this elite in multiplayer matches. Description: To get this achievement, you must advance Wraithlord to level 10. This can be done by playing through the campaign and using this elite in multiplayer matches. Description: To get this achievement, you must advance Autarch Kyre to level 10. This can be done by playing through the campaign and using this elite in multiplayer matches. 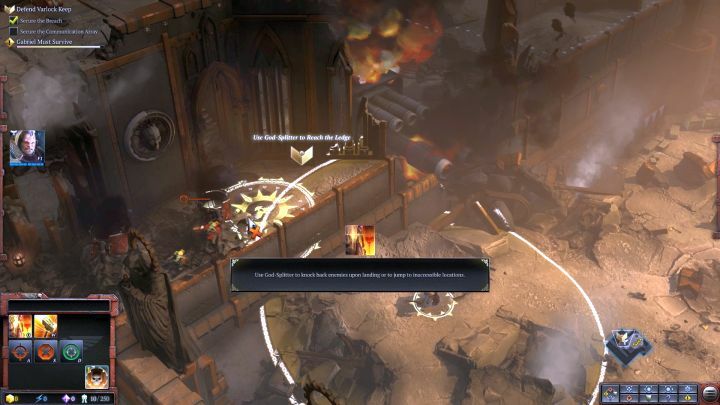 Warhammer 40,000 Dawn of War III is a real-time strategy (RTS) that uses quite an advanced graphic engine. The game, especially unit models, are well-made and the optimization of the game is decent as well. 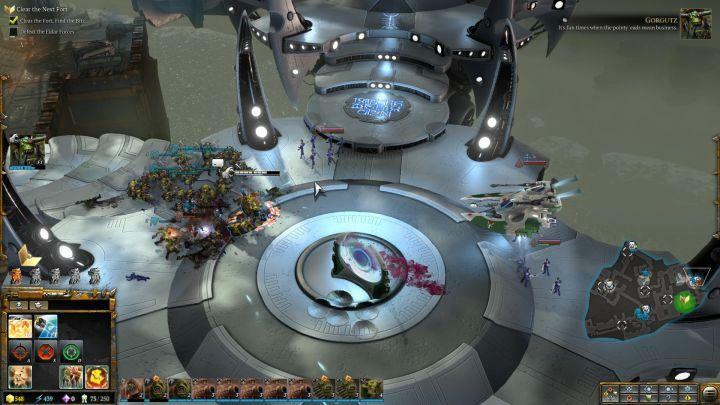 The game sometimes loses smoothness and drops frames, especially during bigger encounters where a lot is happening on the screen, but this problem is visible in any modern RTS game. The following guide was prepared on a middle-tier PC, equipped with i5-3470 CPU, NVIDIA GeForce GTX 970 Gaming G1 and 16GB of RAM. This machine was capable of running the game smoothly, in 1080p. There were few minor problems with the performance of the game, when it dropped to around 40 frames per second. This specification allowed the game to run smoothly, in the 1080p resolution, during most of the time. During over dozens of hours, the game lost smoothness only a few times, dropping to about 40 frames per second. The first mission of the single player campaign, during which you will be controlling the Space Marines. The objective of the mission is to push back the Ork invasion on the Varlock Keep. The mission itself serves the purpose of a detailed tutorial. Gabriel Must Survive – if Gabriel Angelos dies, the mission will be over. The beginning of the mission and the first usage of a special ability. After a series of cut-scenes, the mission will finally start, giving the leader of the Space Marines, Gabriel Angelos, under your command. During the first minutes of the mission his effectiveness will be severely reduced, as you won’t have access to his special abilities. You should take note of his passive ability, Critical Strike. By default, every sixth attack Gabriel will perform an enhanced strike, jumping into the air and slamming into the ground with his powerful hammer. This attack causes area of effect damage, throwing any non-elite infantry away, stunning them. Take out the first Ork units to gain access to the first special ability of this elite unit – Retribution. This is a combination of a defensive and offensive ability. Once activated, Gabriel creates a vortex around himself, dealing damage and knocking all nearby units back (with the exception of some of the elite and larger units). Additionally, he creates a protective barrier around himself, protecting him and every allied unit inside of the globe from ranged attacks, sending them back at the attackers. This powerful ability can be used to counter some of the more powerful ranged units in the game, although you won’t face them during this mission. For the time being, use it when Gabriel is surrounded by a large group of enemies. Once the ability is unlocked, you will also receive a new objective – Secure the Breach. You just have to take out all the enemies coming from the hole in the wall located to the east of your position. Use the newly gained ability and most of the foes should be dead. Take out the remaining forces and then order Gabriel to attack the group coming from the west. Afterwards, a short conversation will initiate and you will be given another objective. Use Gabriels second active ability, God-Splitter, to get to the specified place. Further walk to the east is impossible, which is why you must head towards the marker on the mini-map. It’s located to the west of the position you started at and fought the first Ork group. Approach the specified place and Gabriel will unlock another active ability – God-Splitter. This one allows him to jump to the specified location, dealing area of effect damage to all enemies present in the area, knocking them back as well. Additionally, it can be used to traverse terrain obstacles. Do exactly that now – use God-Splitter to jump on top of the wall located above Gabriel, near the objective marker. Once Gabriel is on the wall, start eliminating Orks. After a short while, two Scout units will join you. Those units are invisible to the enemy due to the camouflage they use – enemy units won’t be able to see and attack them, unless there’s a detector there, or the Scouts are ordered to attack something. Scouts shouldn’t be used for combat but for reconnaissance – they have a huge vision range, allowing them to easily spot most enemies. They can use stun grenades – enemies hit by them will receive a tiny amount of damage and will be blinded, preventing them from moving and attacking for a short while. The first Space Marine Drop Pod you can call in. Continue your march along the only available path, eliminating the enemies coming from the other side of the bridge. Make sure that no Ork unit gets close to the Scouts, your units are extremely vulnerable to melee attacks. Once you step on the bridge, you will be given an option to call in a Drop Pod. Click on the icon located at the left side of the screen and indicate the place they should land at. After a brief delay, a Drop Pod will drop to the ground and a Tactical Marines squad will emerge from it. Those are the primary ranged units of the Space Marines faction, vastly outperforming Scouts when it comes to combat effectiveness. However, try not to let any enemies near them, as they are still vulnerable to melee attacks. Continue your march until you reach another group of enemies. The first of many Health Packs you will stumble upon during the campaign. Once you reach the turning, you will stumble upon the first Health Pack in the game. Those are special items that can only be found during the single player campaign. They replenish the health of a unit – they are capable of healing about 2/3 of the total health (restoring the squad size as well) of regular units and a varied amount to elites (depending on the total health of the elite unit). Take out all of the enemies in the area, send Gabriel to the Health Pack and continue the march. Watch over the Tactical Marines and Scouts. You will reach an open area, where a group of Orks is fighting with the Imperial Guard. Move slowly, taking out all of the enemies along the way and monitor your Tactical Marines and Scout units. The Orks will be dropping reinforcements with Drop Pods and most of them will land in the middle of your vulnerable units. If that happens, send Gabriel Angelos to take out the Ork melee-oriented Boyz. Use the nearby Health Packs if needed, especially if a squad lost a portion of the units. Take out enemies and move north-east and after a short while reinforcements will arrive. Scout Sniper units are extremely effective at eliminating enemies from a huge distance. Two squads of Scout Snipers will join your team. Those units require a moment to set up and be able to fire and are extremely vulnerable to melee attacks, but have huge attack range and are capable of dealing severe damage to enemy troops. They are immensely effective against enemy ranged units, but you always have to keep another melee-oriented squad (like Gabriel Angelos, or, in the worst case scenario, Tactical Marines) near them to protect them from attacks. Order your snipers to attack the enemy unit marked by the game – they should be able to take them out in seconds. Take out all the enemies in the area to complete this objective and start another one. Journey through the narrow bridge is a perfect opportunity to abuse Agenlos’ abilities. You need to get across another bridge full of Orks. Take them out and move forward to initiate a short cut-scene. Once you’ve regained control, move a little further to start yet another cut-scene. The passage will now be blocked and you will lose control over the rest of the units. Fortunately, Scout Snipers will provide support from a safe distance. Order Gabriel to jump to the other side with the help of God-Splitter and take out the enemies present there. Assault Marines will help Angelos in melee combat. After a short moment, another icon should appear, allowing you to call in more reinforcements. This time an Assault Marines squad will emerge from the Drop Pod. This is a very mobile Space Marine infantry, specialized in melee combat and hit & run tactics. Additionally, they have access to jetpacks, allowing them to traverse quite a long distance (or get to higher/lower ground), dealing damage and knocking back units in the landing zone. Use them and Gabriel to take out the nearby enemies and head towards the marker. Use the Health Packs scattered around the area to heal your units if needed. Once you’ve eliminated all of the enemies, the objective will be completed and you will be given a new one. Recruit new units and reinforce those that were injured in previous encounters. With the new objective, you will be given two additional Tactical Marines squads and a Dreadnought. The latter is a heavy walker unit specializing in melee combat, capable of dealing with practically any enemy in the game, outside of some of the more powerful elites. What is more, a Dreadnought is extremely durable and will take a lot of punishment before going down. You’ve also been given a new Space Marines building – Barracks. Use them to recruit more units and/or reinforce the ones that were injured in previous encounters. You can recruit any unit you want, although getting an additional Tactical Marines and two Scout Snipers units is the best choice. Once you’re done, order all of your units towards the marked on the map. You need to access the arena located below, but first you have to get through numerous Orks’ units. Snipers are extremely effective here, as they have a height advantage. 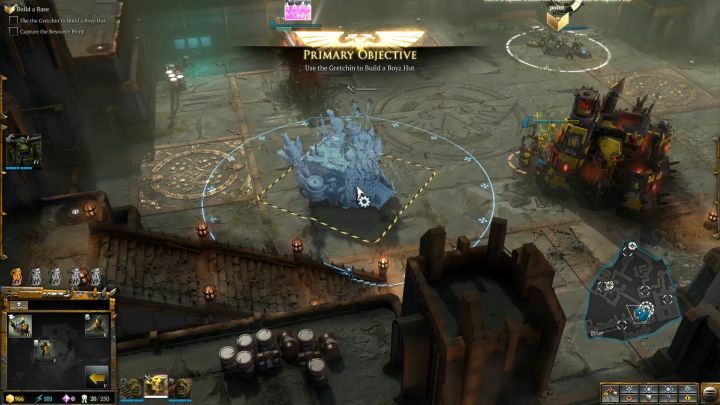 Take out all Ork units, heal your own forces with the Health Packs and head to the arena located below to activate the last objective of this mission. Proper unit placement is crucial. Proper unit placement is crucial during this encounter, as you will be attacked from every direction. Most of the enemy units will run from the front, from the direction of the large gate – place your Assault Marines and Gabriel there. Dreadnought should be ordered to guard the passageway you’ve entered the arena through. The walker will protect your vulnerable ranged units from enemy attacks, as a large group of Orks will soon come from there. Scout Snipers and Tactical Marines should be placed between those two walls, to prevent them from getting engaged in melee combat. Your goal is simple – your army, or to be more specific, Gabriel Angelos must survive. Focus on blocking the enemy melee units with Gabriel, Assault Marines and Dreadnought. Snipers should be ordered to take out enemy ranged units (those will be, in most cases, standing on the stairs) and leave Tactical Marines on their own. Also, note that you can call a Standard (with Plant the Standard ability) to a specified location, giving your units additional profits and empowering them. This can be done by pressing G and specifying a location – although you won’t be able to use it until the end of the mission. Plant the Standard ability will unlock at the end of the mission. Take out enemy units until a Deff Dread, a large Ork walker enters through the gate. This means that the mission will soon be over. Take out all of the enemies in the area. Afterwards, a cut-scene will initiate, completing the mission as well. The second mission of the single player campaign, during which you will be controlling Orks. The objective of the mission it to get through the enemy defenses and during it you will be facing both Eldar and Space Marines. Gorgutz Must Survive – if Gorgutz dies, the mission will be over. The Big Gun Must Survive – the huge cannon you will control during the final moments of the mission can’t be destroyed. Use the Grapplin’ Klaw to get to the other side. At the beginning of the mission you will be controlling Gorgutz, the leader of the Orks. This is a typical tank elite unit – he won’t deal huge damage on his own, but he’s extremely durable and hard to neutralize. He has access to two useful abilities – Grapplin’ Klaw, which can be used to get to a specified position (or higher / lower ground), dealing damage to enemies in the area and forcing them (taunt) to attack him. The second one is Spinnin’ Klaw – once activated, Gorgutz starts swinging his claw around himself, dealing damage to enemies in the area and blocking all ranged attacks. The ability can be reactivated – Gorgutz then sends his claw towards specified location, dealing damage and taunting enemies. Additionally, the ability can be left active till the end – if Gorgutz looted Scrap (more on that in a second), all of the nearby allied units will be healed once the ability ends on its own. Enemies hidden in heavy cover are no match for Gorgutz. Once you gain control over Gorgutz, use Grapplin’ Klaw to get to the Ork squad located to the east of your current position. Those are Shoota Boyz, the primary ranged infantry of Orks. They will join you as soon as Gorgutz approaches them. Head east through the wall, eliminating all enemies along the way. Soon, another Ork squad, Boyz, will join you. This is a primary melee unit of the Ork faction and the most powerful “starting unit” (the one you can build from the beginning of the game) in the game. To the east of your army, at the top of the stairs, there’s a group of enemies hidden under heavy cover. Send your Boyz and/or Gorgutz to quickly take them out – Boyz have Counters Cover ability, allowing them to enter enemy heavy cover, whereas Gorgutz can use his Grapplin’ Klaw to taunt enemies out of it. Take the enemies out and continue the march. Use the bushes to avoid the enemy fire. You need to get to the other side of the wall while hiding your units in the tall grass. You will soon reach the wall with a closed gate. Order Gorgutz to use his Grapplin’ Klaw to get on top of the wall. Take out all the enemies present there and head towards the mission marker. Once there, destroy the gate control panel – this will allow the rest of your forces to enter the fortress and will unlock a new objective. Defeat the remaining defenders of the fort. Head inside the fort and take out all the enemies stationed there. Soon, a large group of Ork units will join you in combat. You won’t be able to control them, but they will attack your enemies. Once the cut-scene is over, a new objective will be given to you. It’s time to build your own base! Your task is to build your own base. Send any unit to capture the resource point located inside of the fort. In the meanwhile, select Gretchin and order them to build a Boyz Hut. Once the resource point is captured, start building both generators – Requisition and Energy – there. Afterwards, a pile of Scrap will appear near the Waaagh Tower located in the base. Send one of your units (or Gorgutz) to equip them with Scrap, empowering them. Once all of the steps are done, a new objective will activate. It’s time to use Gorgutz’s second ability, Spinnin’ Klaw. Recruit additional Boyz and/or Shoota Boyz units, take 1-2 Gretchin with you and start moving through the bridge located to the west of the fort. About midway through the bridge, you will be presented with the information to use Gorgutz’s second ability, Spinnin’ Klaw. This will allow your army to traverse the rest of the bridge without getting obliterated by enemy defensive structures. Place all of your units near Gorgutz, activate the ability and start moving through the bridge. Don’t forget to order them to destroy enemy defensive structures – this will come in handy later. Capture the resource point and construct generators there. Head to the mission marker where another resource point awaits. Take out all the enemies guarding the point and order any of your unit to capture it. Once it’s done, build generators on top of it and order one of your Gretchin to construct a Listening Post there as well. Search the fort area thoroughly now, as you have to take out every single enemy lingering here. Once it’s done, you will be given another objective. Build Boyz Huts from time to time to be able to easily replenish your troops. Go through the gate and move a little further. Another turret will be blocking your wait. Use Gorgutz’s Spinnin’ Klaw once more to be able to get your troops to the other side safely, eliminating the said turret while your units are on the move. 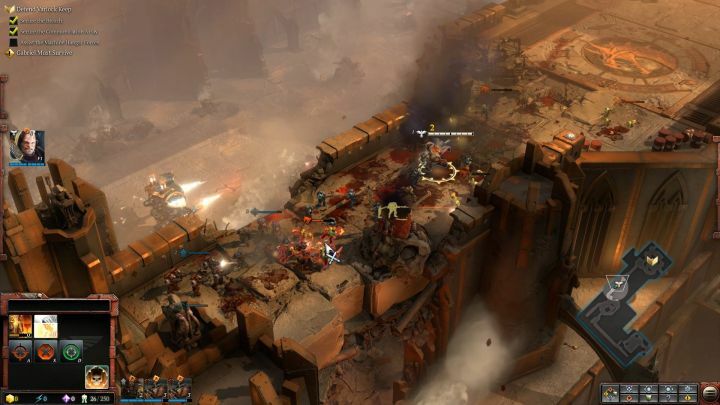 Afterwards, use Gorgutz’s Grapplin’ Klaw to jump to the enemies hiding under a heavy cover – this will draw their attention to Gorgutz, allowing your troops to move without getting hurt and engage the enemy. Once all that is done, capture the resource point in the area, build generators and Listening Post on top of it and take out the remaining enemy forces. You should build another Boyz Hut here now – this will allow you to easily replenish your troops and new units won’t have to run across the entire map. Don’t forget to destroy a small control panel near the southern gate! Head towards the next mission marker. Direct route won’t be available, you will be forced to take a little detour. There will be larger groups of enemies in this area, but your own army should be strong enough to take them out without any problems. Continue towards the marker and you should soon reach an area where the Elder will join the fight. Take out all the enemies, but before you continue your journey, destroy a small control panel near the gate located to the south of your army. Doing so will open the said gate, giving you access to a shorter route to your base and allowing to easily replenish your troops and bring in the new units. Afterwards, head through the gate and to the east. Clear the area and construct a Boyz Hut. Take out the Eldar forces and, once it’s done, send Gretchin to build another Boyz Hut. Once complete, send your units near it to reinforce them and recruit new units. Afterwards, head east to reach a more futuristic area where another group of Eldar forces will await you. Take them out and head south, towards the mission marker, eliminating all the enemies along the way. Once you’ve cleared the area, a short cut-scene will initiate. The cannon will misfire several times. Once the cut-scene is over, the last objective will activate. You have to defend the huge, goofy-looking cannon and take it back to your base. You won’t be able to move it directly, which is why you need to wait for the cannon to be charged (represented by the bar on top of the screen). Once it happens, a button to fire the cannon will appear. The cannon will misfire and you will need to wait and charge it again to be able to try once more. The second attempt will also be a failure, the third shot will yield results you’re waiting for. With the third shot, the cannon will finally fire and the recoil will move it slightly to the west, towards your base. Subsequent attempts will allow you to move the cannon back to the base. This peculiar movement method will allow you, after several shots, to move the cannon all the way back to your base. Your task here is simple – you need to protect it from the enemy, wait for the cannon to charge and fire it to move it towards your base. Afterwards, you have to repeat the whole process until it reaches its destination. You should also build a Boyz Hut near it – this will allow you to replenish your forces after an enemy attack. Once the cannon lands in your base, a cut-scene will initiate and the mission will end. 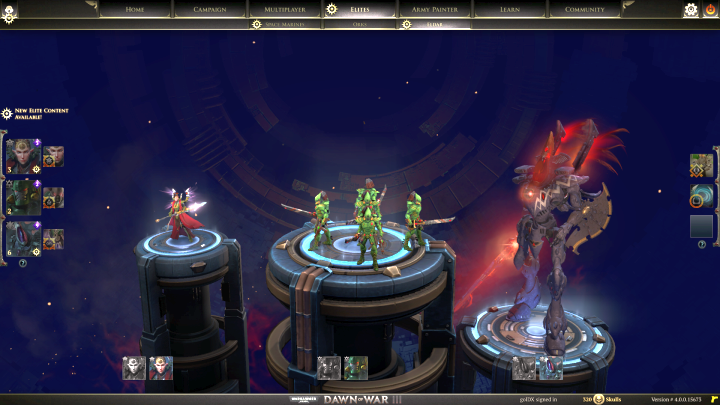 In Warhammer 40,000 Dawn of War III there are three different resources available to the player – Requisition, Power and Elite Points. Similarly to the previous installments of the franchise, those are gathered by taking control over resource points scattered around the whole map – doing so will increase your income per minute of a given resource type. 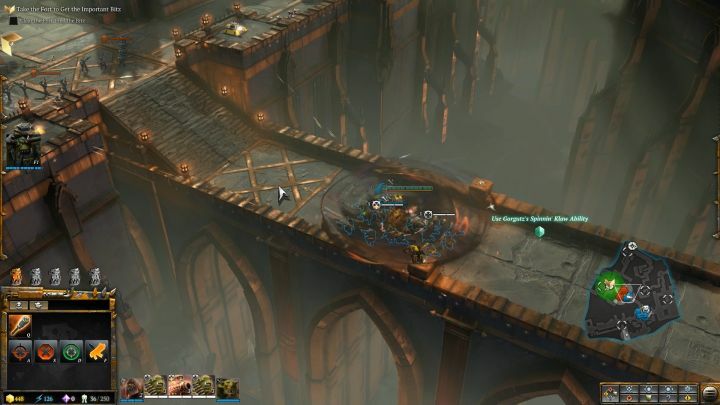 In Dawn of War III, however, capturing point won’t be enough to give you additional resources – this will only give you control over the point. To get any benefits of it, you must construct Generators on top of it. Resource gain can be increased by constructing Generators on top of resource points. Those are special buildings that can be placed on top of resource points, provided that a specific resource point has free room for any of those. Each resource point has special “sockets” attached to them and each of them can have one of the three colors – yellow (Requisition), blue (Energy) and purple (Elite Points). You can place different generators on top of each of those – a Retribution-generating on top of a yellow one, Power-generating on top of a blue one and one that will increase Elite Points gain on a purple. Finally, each resource point can have from 1 to 4 of those sockets – the number of them, as well as their types, can be checked, above all else, by looking on the mini-map. Once the generator construction is finished, it will start generating resources. However, it’s not over yet. The amount of resources gained from a resource point can be increased by upgrading the said point. The option to upgrade it will appear once at least one generator is already constructed on the resource point. Once the upgrade is done, the amount of resources generated by all of the generators on that point will increase by 25%. The upgrade can be done up to three times, increasing the resource gain of a point by 75%. What is more, both you and your allies can place generators and/or start upgrades on resource points – no matter who captured the resource point. Placing a Listening Post on top of a point will prevent the enemy from recapturing the point, but it won’t increase the resource gain. If the enemy wants to recapture a point, he has to first destroy the Listening Points and then all of the constructed generators. Generators are constructed individually – if you want to, for instance, construct two at the same time, the second one will get into queue and start constructing once the previous one is done. This is why you should always (unless you have a huge surplus of resources) build them one by one to save resources. The Escalation phase also influences the amount of resources your points generate. You can check the phase by looking into the upper right corner of the screen – it will be I, II, III or IV. The first (I) phase has no influence on the amount of resources, but each subsequent ones increases it by 50%, up to 150%. Escalation phases change after 10 minutes – once the match lasts at least 30 minutes, the last (IV) phase will begin. 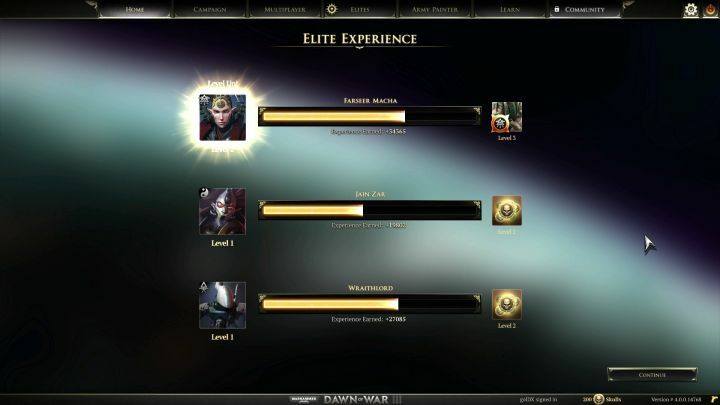 Elite units receive accumulated experience points after the game / campaign mission. As mentioned in “Elite points and elite units chapter”, each elite unit in the game receives experience points. They receive them for taking part in the match – each kill, building destruction or elite unit elimination gives them a certain amount of XP points. Experience points are awarded to the elite units at the end of the game / campaign mission and each one of them can advance up to level 10. Advancing to level 2, 4 and 7 gives the player additional Skulls, the in-game currency used to unlock new elites and Doctrines. Advancing to level 3 and 8 unlocks new doctrines. 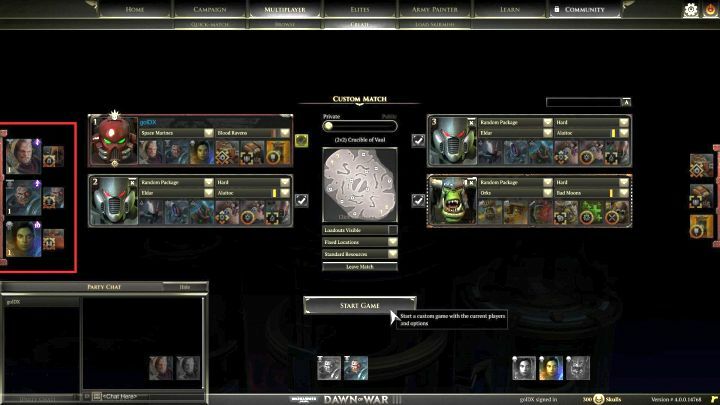 Advancing to level 5, 6 and 9 gives access to cosmetic items, such as portraits, new paints and skins for the elite unit. Advancing to level 10 unlocks the Hero’s Mark, giving the elite unit a unique circle underneath it, announcing that you’ve maxed out the unit. Additionally, 30 achievements are associated with advancing the units to the maximum level, 1 achievement per elite – more on that can be found in the “Achievements” chapter of this guide. Note – if you leave a multiplayer game before it ends (before destroying any of the power cores), your elite units won’t gain any experience points. Keep that in mind before deciding to flee and leave your allies! Units hidden under heavy cover are protected from most attacks, but they aren’t invulnerable. 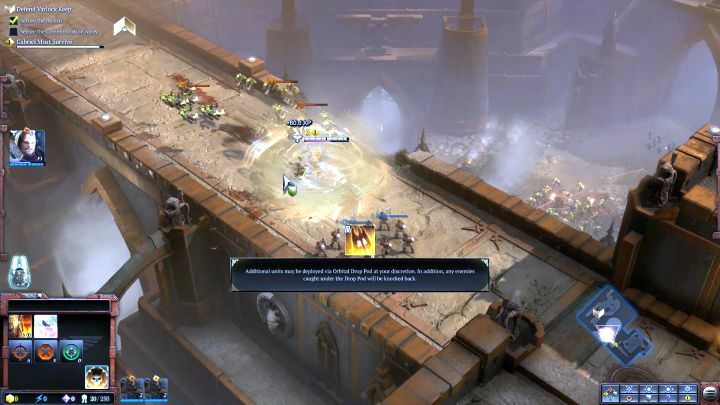 Heavy cover, even though it doesn’t provide the player with so many combat possibilities as the system in previous installments of the franchise (as well as in the Company of Heroes series), allows a player to protect his infantry from enemy fire, especially if the enemy player doesn’t know how to breach it. However, heavy cover can also become a deadly trap. Using melee units with the Counters Cover trait. Most of the melee units (and some of the elites) have this. It allows the units to freely enter the enemy heavy cover and attack the units hiding underneath it. Taunting abilities – abilities that force units to attack a target. The best example is Gorgutz’s Grapplin’ Klaw. Once he leaps to the target, all the enemy hit by the ability will be taunted, forcing them to attack Gorgutz. In the case of the heavy cover, this ability allows the elite unit to simply drag the forces hiding underneath it out of the cover. Units equipped with flamethrowers. Tactical Marines are the best example. You just need to order them to get close to the heavy cover and use their flamethrower ability (after you’ve purchased the necessary upgrade). As there’s not much space under the cover, the units located there will suffer extremely high damage – this ability is capable of taking out most ranged units in seconds. Breaking through the cover. The protective bubble created by the heavy cover has a limited durability. This is represented by a health bar located above the shield. The bar goes down when taking damage and once it’s empty the shield will simply break. What is more, once the shield breaks, it can’t be used again. 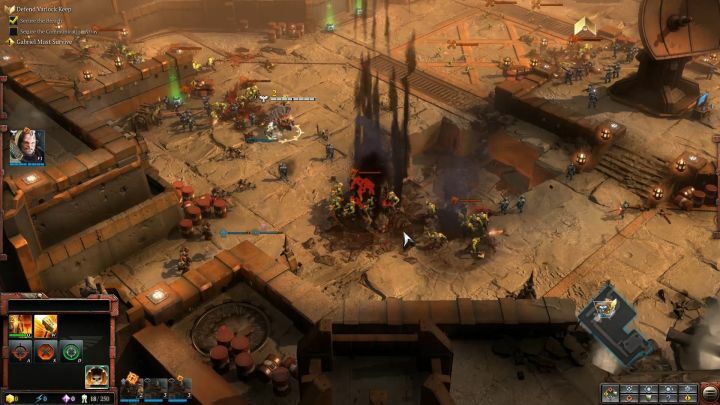 As you can see, proper usage of the heavy cover can change the situation on the battlefield, but it can also end badly – losing multiple units to a single flamethrower ability can even cost you a game. 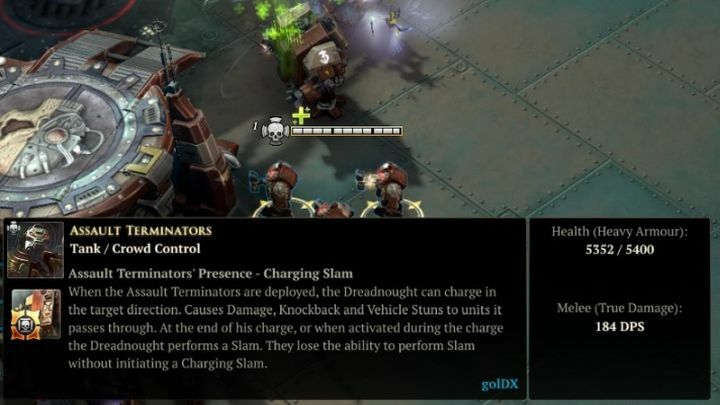 Assault Terminators are one of the few units in the game dealing true damage. 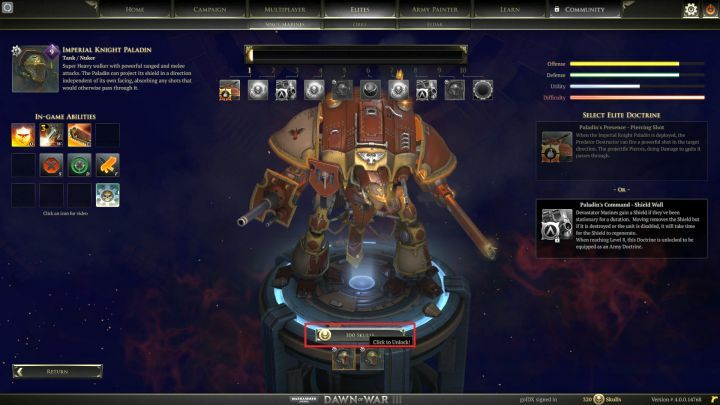 In Warhammer 40,000: Dawn of War III there are three types of damage: Normal, Armor-piercing and True Damage. Each type is effective against specific type of armor – Normal damage is effective against enemies with Normal Armor, dealing 100% damage to them, while extremely ineffective against Heavy Armored foes, dealing only 22% of the total damage. On the other hand, Armor-piercing damage is good against armored foes, dealing 100% damage, but less useful when fighting enemies with Normal armor – in that case, enemies will suffer only about 40% of total damage. The solution to the Normal/Armor-piercing problem is the true damage attack type, dealing full (100%) damage against any foe, regardless of their armor. There’s only a small group of units capable of dealing true damage – elite units, like Gabriel Angelos and Assault Terminators, and regular ones, like the Killa Kan from the Orks. True damage is extremely useful when dealing with heavily armored enemies and buildings. The best example in the game is the Space Marines’ Assault Terminators unit. Normally, they are ineffective against buildings, as they are only dealing normal damage (22% of their total damage output). However, by finishing an upgrade in the Arsenal, a player can change their damage from normal to true, causing them to be extremely effective at harassing opponents, especially at destroying Listening Posts. 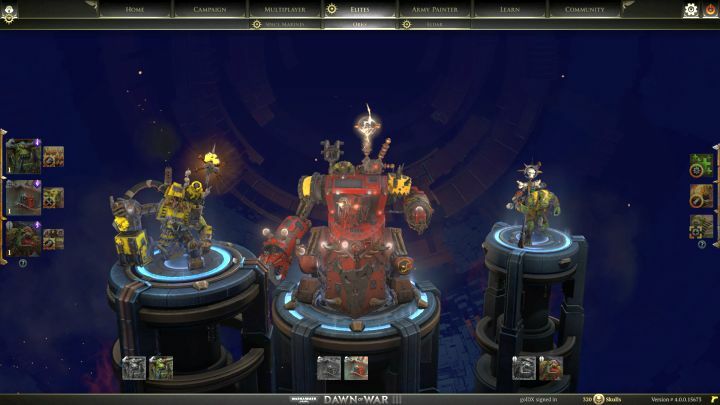 Elite units and the mechanic standing behind them is a complete novelty in the latest installment of the Warhammer 40,000: Dawn of War franchise. In the previous titles, the player had access to hero units. 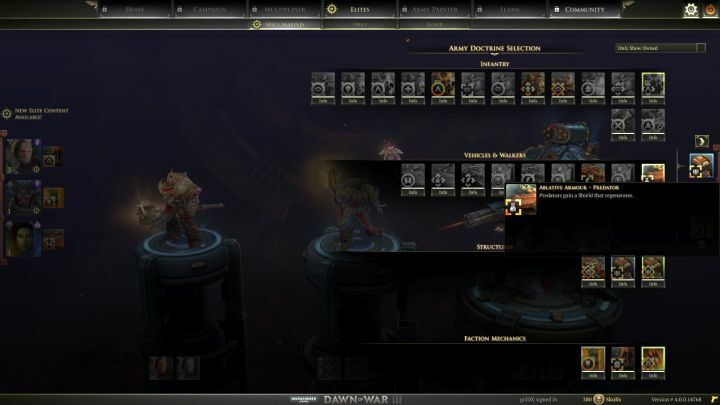 In Dawn of War III it’s still here, but the mechanic changed severely. There are two reasons for that – the necessity to select which units you will be able to use before the match starts and the resources required to call them. The currently selected elites are visible near the left side of the screen. Assassin – Assassin deal higher damage than most of the elites, are capable of swiftly moving around the battlefield and, quite often, teleporting from one place to another. Increased mobility and damage output come at a price – those elites are extremely vulnerable to attacks. They are perfectly suited for quick elimination and hit & run tactics. Crowd Control – elite units from this group have abilities that can silence, stun or displace enemies and some of those abilities can target whole groups of troops and deal area of effect damage. Those units are mostly used to disrupt enemy forces and annoy other players – thanks to them you will weaken or even disable enemy units for a short while, giving you an edge over them. However, duration times of those abilities are short and the Crowd Control elite units aren’t suited for combat, losing to most regular units on the battlefield. Nuker – elite unit from this group have access to extremely powerful abilities that are capable of devastating single units, as well as entire groups of enemies. Nukers are similar to Assassins, as they are focused on dealing immense damage in a short amount of time. However, they are more effective against larger groups of enemies and weaker when fighting with single, powerful foes. Support – elite units from this group have access to abilities that are used to support allied units. They can heal, create shields or even teleport allied troops from one place to another. They are the exact opposite of the Crow Control elite units – instead of disrupting enemy units, they are focused around helping their allies. Similarly to the mentioned Crowd Control units, Support ones aren’t suited for direct combat, as they are weaker than most units in the game. Tank – units from this group are characterized by immense durability, making it extremely difficult to take them down. They often have abilities that allow them to heal themselves or block enemy attacks directed at them. They are very effective at harassing enemies and limiting their usefulness – they are capable of, quite literally, sticking to an enemy unit or group of units and deal constant damage. Tank elites are effective against almost every unit groups in the game, however they aren’t as good against powerful ranged squads. What is more, in most cases elite units belong to more than a single group. Elites from the Tank group are often extremely good at Crowd Controlling, Assassins often have the capabilities of Nukers and so on. The summoning process of an elite unit is trivial – you just need to click on the unit portrait located at the left corner of the screen (or press F1-F3 button) and select the place you want the elite to spawn at. However, before you can do that, you must first make sure that the elite unit will be available during the game. During the singleplayer campaign, the game will force you to use specific elite units, but in the multiplayer you will have full control over the units you want to have in your army. Each player can have up to 3 elite units in their roster. Those can be customized from the Elite Units menu (this can be accessed from the main menu of the game, by clicking the adequate button located at the top of the screen) or after you’ve joined the game. In the latter case, the currently selected elite units can be checked by looking at the left corner of the screen. By clicking their portraits you will be able to change the elite unit or customize it. New elite units must first be unlocked. The second problem is the fact that you must unlock the unit before it can be used. By default, each player will have access to three elite units from each faction. One of them is a “leader” of the faction (the hero you will use during the campaign – Gabriel Angelos for Space Marines, Macha for Eldars and Gorgutz for Orks) and another one is the most expensive elite unit you can recruit, also being one of the strongest units in the entire game. There are additional elite units available for each faction. 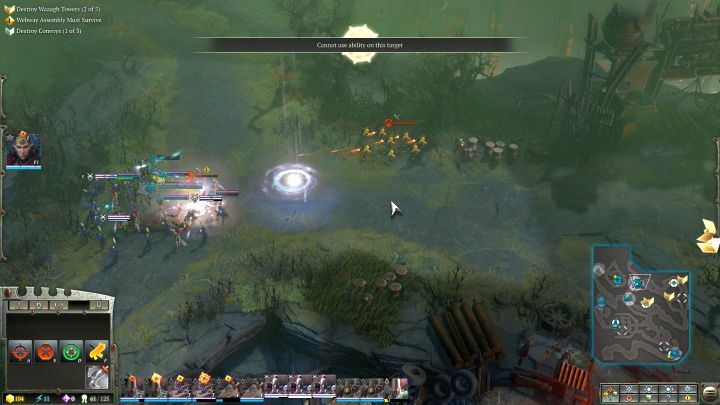 Some of them are simply enhanced versions of normal units you are able to recruit (like, for instance, a ranged Dreadnought), whereas the rest are unique characters, similar to heroes you can find in Warcraft III. Finally, new elite units can be unlocked by using Skulls, an in-game currency that’s used for that purpose (as well as to unlock new doctrines). The amount of Skulls you have can be checked by looking at the bottom right corner of the screen (their acquisition method is discussed in a separate chapter). Once you’ve acquired enough elite points, you can summon the elite unit on the battlefield. Once you’ve unlocked and selected elite units you want to use in combat, you need to get into the game and call them. However, it’s not that simple – you will need a specific amount of elite points to be able to do that. The amount you already have, as well as the time needed to create more elite points can be checked by hovering over the purple icon in the lower left corner of the screen. By default, each player gains one elite point every 120 seconds. This amount can be increased by capturing and building an elite point generator on top of a resource point – this will decrease the time from 120 to 90 seconds. Elite points are generated from the beginning of the game. If your unit requires, for instance, 3 points, you will be able to summon it after 360 seconds, when the game reaches 6th minute. The amount of points you will be able to accumulate is proportional to the length of the game. The longer it lasts, the more points you will be able to accumulate, allowing you to summon more powerful elite units. However, this works both ways – shorter matches won’t allow you to summon very expensive units. Elite units should be selected differently for each match, depending on whether you’re playing on a 1vs1, 2vs3 or 3vs3 map and you need to anticipate their length, at least to some extent. You shouldn’t take the cheapest ones, because an enemy with stronger elite units will eventually be too strong for you to handle, but there’s also no point to use the most expensive ones, requiring you to play over 50 minutes to accumulate enough elite points. 1vs1 matches – those last up to 20 minutes. They allow you to generate 10-12 elite points, there’s no point to exceed this number when selecting your elite units. 2vs2 matches – those typically last from 20 to 30 minutes, allowing you to generate 10-20 elite points and giving you more freedom in unit selection. 3vs3 matches – those often last longer than 30 minutes, especially if more experienced players are in the game. They will allow you to easily generate more than 20 elite points – using the most expensive elite units in this case can be beneficial. Those values can differ slightly, as there’s no rule. Generally speaking, however, you should stick to it, because in most cases, when the enemies aren’t sitting in their bases or aren’t overly aggressive, those matches should look like that. Command doctrine marked with red and presence doctrine with blue. Last thing worth mentioning when it comes to elite units are the unique doctrines that they bring to the battlefield. Those are divided into two groups – Command Doctrines and Presence Doctrines. The former are active when the elite unit is in the roster – you don’t even need to summon it to the battlefield. The latter are active once the elite unit is deployed to the battlefield. Presence Doctrines are, in most cases, stronger and offer greater benefits. What is more, Command Doctrines can be unlocked as an army doctrine (more on that in a separate chapter), once you advance a specific elite unit to level 8. Proper elite unit selection. You should chose elite units that supplement your playstyle. If you like to attack your enemies with overwhelmingly large armies, there’s no point to invest in mobile elite units specializing in hit & run tactics. Remembering about elite point costs of the units. Each elite unit has its own deployment cost (from 2 to 10) and the amount of elite points you will have depends on the length of the game. When an elite unit dies in battle, you will need to wait for some time before it can be deployed again. Redeployment is completely free (you don’t have to use elite points again), but with each death the elite unit will need more time to respawn. Most of the elite units can be summoned near your (or your allies’) base, or near a resource point controlled by your team. Sometimes it’s worth to refrain from deploying cheaper elite units to the battlefield to be able to summon a more expensive ones. In most cases you won’t have the luxury to do so, but sudden deployment of a 9 or 10 point elite can change the outcome of the entire match. Detectors in Warhammer 40,000: Dawn of War III are basically units that are capable of revealing units with camouflage. Aside from some of the elite units that can use camouflage, there are three units in the entire game capable of “becoming invisible”. Those are Scouts from the Space Marines, Rangers from Eldars and Orks’ builders, Gretchin (after activating a special ability). Camouflaged units are invisible to enemies until they attack, or the enemy has a detector located near them. Turrets and shields – both have a revealing aura. Note – Detector abilities won’t work on units hidden in bushes / stealth cover, unless the detector is located in the same bush / cover as the hidden unit. Orbital Relays are used to drop Space Marines troops to any place on the battlefield. The armies of Space Marines are less numerous, but they are tougher and capable of dealing higher damage. When playing with this faction you should focus on concentrated attacks and prolonged battles, as their units are most effective during those. However, they are less effective at hit & run tactics and harassment. Also, because of their low unit sizes, using even a single one of them can be devastating. While playing as Space Marines, you must make use of three different faction mechanics – the ability to call your troops to any place on the battlefield, to call in a standard and to use an orbital bombardment. Orbital Relays are used by Space Marines to drop, with the help of Drop Pods, their units to any place on the battlefield. This is extremely useful to quickly move your units around the map, or to support your allies with a small group of your units when sending your army is out of the question. This is also a perfect way to surprise your enemy. Sending Drop Pods containing Assault Marines into several ranged units of the enemy is the worst that can happen to your foe. What is more, upon landing the pods will deal minor damage to enemies in the landing zone, knocking them away in the process, making it a good crowd control option. Drop Pods can also be used offensively – you only need a little bit of vision near an unprotected enemy resource point to drop a capsule right next to it and start your attack from there. It will either give you access to a new resource point, or force the enemy to defend it, allowing you to attack a different place. Normally, your enemies won’t see that you’re planning to drop a Drop Pod with units, but if they have a detector located nearby it will be visible to them as well. What is more, thanks to Orbital Relays, the Space Marines can produce units outside of the production buildings and their production queues. Units are created in the Drop Pods and the rest of the buildings can be used for different purposes. However, in order to recruit more advanced units than the Tactical Marines, you still need to construct the required buildings. You should also remember about the Deathstorm Drop Pods. Those are special types of Drop Pods that, upon landing, open up and start shooting at nearby enemies. Those Drop Pods have one of the highest DPS ratings in the entire game and can decimate an entire enemy army in seconds. Tech level III – the standard will also heal nearby allied units. What is more, enemies located in the drop zone will be knocked away. You should be extra careful when calling the standard, as enemy units can easily capture it – once that happens, you will lose all the benefits of it. Orbital Bombardment is the super ability of the Space Marines. Once activated, the player selects two locations – the first one sets up a special beacon, whereas the second indicates the starting position of the bombardment. After a short while, the beacon falls to the ground, bringing down a powerful orbital bombardment beam with it. 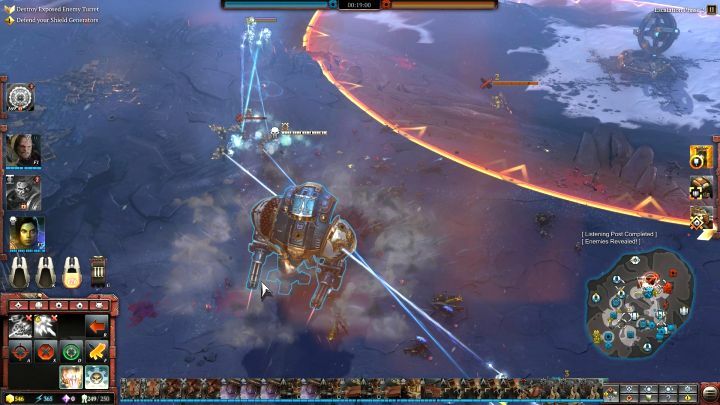 The beam can then be controlled, allowing the player to attack other units. This ability is capable of causing devastating damage, increasing further as the ability goes on. What is more, the enemies you hit with the beam are suspended in air and won’t be able to run away from the damage. 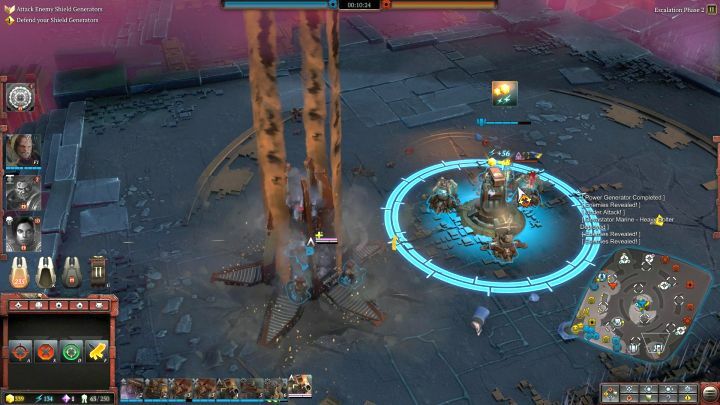 However, similarly to the standard, the beacon can be captured by an enemy unit. Once that happens, the bombardment will continue, but you will lose the ability to move the beam and enemy units won’t be suspended anymore. Another drawback of the ability is the cost – it requires 2 elite points. Using the Orbital Bombardment can save your skin, but it will also severely delay the moment at which you will be capable of calling more powerful elite units to the battlefield. Space Marines elite unit selection screen. Like with the Eldars and Orks, there are 9 elite units that a Space Marine commander can choose from. Those are: Kill Team Ironmaw, Chief Librarian Jonah Orion, Chaplain Diomedes, Gabriel Angelos, Terminators, Assault Terminators, Venerable Dreadnought, Imperial Knight Paladin and Imperial Knight Solaria. The cheapest Space Marine elite units, extremely effective during the early game (first 15-20 minutes). This is basically an enhanced Tactical Marine unit which can be equipped, for free, with either a flamethrower or a rocket launcher. The first is deadly against enemy infantry units and doesn’t require activating like the flamethrowers of Tactical Marines, whereas the second one significantly increases the effectiveness of the unit against heavily armored targets. This unit has a very useful doctrine. It allows Kill Team Ironmaw to deploy anywhere on the battlefield, as long as you have vision there. What is more, you can deploy any elite unit near Kill Team Ironmaw. It makes it extremely useful when planning a sneak attack on the enemy base, or when you want your units to jump into the middle of the enemy army. Additionally, they have a special ability that allows the player to call them back – once done, they can be deployed again within seconds, with full health and a new weapon upgrade. In theory, Jonah Orion looks promising – a decent support unit, with numerous useful abilities to choose from. Thanks to them, he can deal damage to enemy units with a lightning bolt, enhance allied units and, if needed, create a shield that will block enemy ranged fire and unit movement. The biggest problem comes with the said shield – when used properly, it can save allied units or block enemy movement, preventing your foe from retreating. However, allied units located inside the shield won’t be able to attack as well, not to mention their inability to leave the protected area. Incorrect usage of this ability turns it into a death trap. Jonah’s presence on the battlefield influences the Plant the Standard ability of Space Marines as well. Once he’s deployed, the standard, outside of its typical bonuses, will also protect nearby units with a shield (the same as Jonah’s ability), blocking enemy movement and ranged attacks. Again, this can cause you to create a death trap for your troops. This is an elite unit that should only be used by experienced players. Diomedes is a combination of Gabriel Angelos and Jonah Orion. This is an elite unit that is partially focused on supporting his allies, while simultaneously being able to take on enemy fire on himself as a tank. However, the fact that he fights in melee range and has only a single ability makes him less effective than other elite units. On the other hand, he gives you access to a powerful doctrine, similar to that of Macha from the Eldar faction – when one of your elite units is about to die, it will instead be rendered invulnerable to attacks for a very short time, allowing you to retreat it from the battlefield. Unfortunately, this ability has a very long cooldown time. The basic elite unit that every player will have access to, as well as the main elite unit used during the single player campaign. 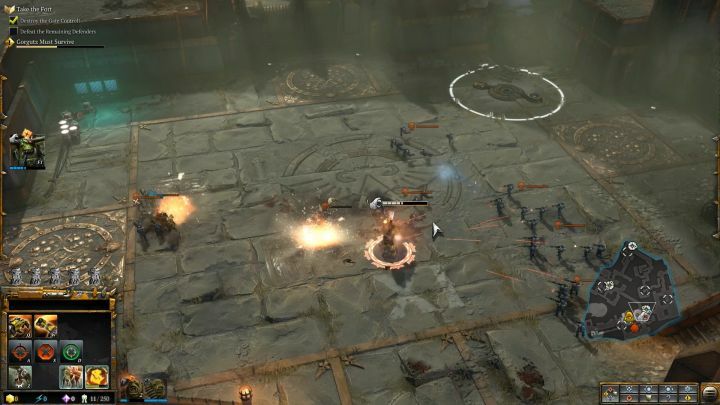 Gabriel Angelos is the most effective during the early stages of the match, when there aren’t large groups of ranged units on the battlefield. He is capable of defeating most units in the game, especially in the same price range, on his own, as well as taking out several entire units without the help of anyone. Unfortunately, his usefulness starts to diminish as the game goes on, when most of the players have access to multiple units at once. When that happens, his abilities are no longer effective and the fact that he moves rather slowly and is limited to melee combat makes it even worse. This makes Gabriel Angelos extremely effective during the first 15-20 minutes. A Terminator squad is a powerful unit, extremely effective in combat. They have a large health pool, are capable of dealing with every unarmored foe, especially in ranged combat in which they specialize (but they can hold their ground in melee as well) and are immensely powerful when dealing with large groups of enemy infantry, which they can easily decimate with their rocket launcher ability. They are probably the slowest units in the game, but they can use a teleport ability allowing them to move around the battlefield instantaneously. This would be an ideal elite unit if not for their price – 6 elite points. Calling it during the mid-game is guaranteed to prevent you from deploying any of the titans (Imperial Knights), as collecting even those 6 points back will take you at least 10 minutes. It’s worth to use them when you’re not planning on deploying Imperial Knights – otherwise just ignore them. Assault Terminators are similar to the regular Terminators but with one major difference – they are specialized in melee combat. They don’t have any ranged weapon but are capable of dealing immense damage in melee. They have a special ability that allows them to damage enemies located around them, stunning and slowing them down in the process. Just as regular Terminators, Assault Terminators can also use the teleport ability to move around the battlefield. However, those units are completely not worth it. Even though they are tough and hard to take down, they move extremely slow (and the Teleport ability has a long cooldown) and can only fight in melee range. This allows most units in the game to easily outrun them and harass them from a safe distance. The biggest problem is the price – 7 elite points is only 2 points less than the Imperial Knight Paladin. It’s not worth to use them. Venerable Dreadnought is the modified version of the units available to Space Marines. Created with the sole purpose of ranged combat, this unit is capable of dealing with practically any target on the battlefield – and capable of taking down all, even the most powerful vehicles, in seconds. Additionally, Venerable Dreadnought can fire a powerful plasma projectile – when used correctly, it can devastate the enemy army. What is more, when Venerable Dreadnought is deployed, plasma rifles (after purchasing the necessary upgrade) of Tactical Marines won’t overheat – if you use those units often, this elite unit is a must-have. However, there’s the same problem as with the Assault Terminators – deploy cost. Venerable Dreadnought requires 7 elite points – points that can be used more efficiently. It’s better to wait several minutes and deploy one of the Imperial Knights instead. Imperial Knight Paladin is almost the most expensive elite unit in the game and there’s a reason for that. As with any titan unit (all of the units recruited with 9+ elite points) he is capable of devastating the entire enemy army on his own, turning the tide of the game in seconds. He can attack both from a long distance and in melee range. Additionally, Paladin has access to three special abilities. The first one is a shield, allowing him to absorb all enemy fire from a specific direction. This can be useful when advancing towards a large, range-oriented enemy army. The remaining two abilities are purely offensive. One of them allows Paladin to fire a powerful projectile, going through multiple units and causing immense damage. The second one is used to decimate units attacking Imperial Knight in melee range. This is a very expensive elite unit, as it costs 9 elite points, but you should always try to summon the Imperial Knight – doing so can change the course of the entire game. The most expensive unit in the entire game, as well as the only one that costs 10 elite points. This is, basically, a mobile fortress, capable of dealing immense damage and being almost impossible to take down. Solaria is more efficient at dealing damage than Paladin, mainly due to two special abilities. The first one allows her to deal heavy damage to all units standing in front of her, whereas the second one allows Solaria to fire 6 powerful rockets into 6 specified places. The second ability, when used right, can take out the entire enemy army in seconds. What is more, Solaria has a passive ability that causes the unit to overheat when using abilities and attacking. Ponce it happens, Imperial Knight Solaria will move slower, but her attacks will be altered and will simply deal more damage. This unit is extremely expensive and can cost you the entire game, but her presence on the battlefield can turn the tides of even the most helpless situations. Eldars can easily move all of their buildings. The Eldars outperform other factions when it comes to mobility which they get from a passive ability, as well as the possibility to relocate all of their buildings. This makes this faction extremely effective at hit & run tactics – striking your opponent, retreating back to the base and then repeating the whole process after a moment is a core tactic. However, their units are more vulnerable than those of Space Marines and less numerous than the Orks, making them quite ineffective at prolonged encounters. While playing as Eldars, you must make use of four different faction mechanics: Fleet of Foot passive ability, Relocate, Connect Webways and the Eldritch Storm super ability. Fleet of Foot is a passive ability used by every single unit of the Eldar faction. As long as they are in close vicinity of a Webway Gate, they will be granted a tremendous speed boost, allowing their units to move around the area extremely quickly. The speed buff is so great that even the quickest Ork and Space Marine troops won’t be able to keep up. What is more, Flee of Foot offers more than a simple boost of speed. It will also increase the regeneration rate of Eldar shields. This ability makes their units so effective at harassing enemies and hit & run tactics. You can place a Webway Gate near the battlefield, send your boosted units to attack the enemy and retreat them back to the building once their shields start to wear down. After a short while the shields of your forces will be replenished (and the health of enemy units certainly won’t) and you will be able to strike again. Properly performed, this tactic should allow you to harass your enemy without taking any loses. Note – you need to retreat your units before their shields are broken. Once they don’t have their shields, they will quickly start losing their health to the enemy fire – and this will decrease their numbers, forcing you lose resources and reinforce them. Relocate is a special ability available to all Eldar buildings, aside from generators and Listening Posts placed on top of resource points. It allows you to relocate buildings to any place on the map, as long as you have that area revealed. Once the ability is activated and the relocate location is set, you just need to wait a few seconds and the building will be teleported to the new place. The ability itself has a long cooldown time. This ability gives countless possibilities. You can use it to move a building placed in a distant location and relocate it closer to the battlefield, allowing you to easily reinforce your units and train new squads. You can do the opposite – a building that was placed near the battlefield can be evacuated at any moment, allowing you to save precious time and resources. However, this ability is most useful to transport Webway Gates around the entire map, allowing your units to have the Fleet of Foot passive everywhere they go, immensely increasing their offensive and defensive capabilities. 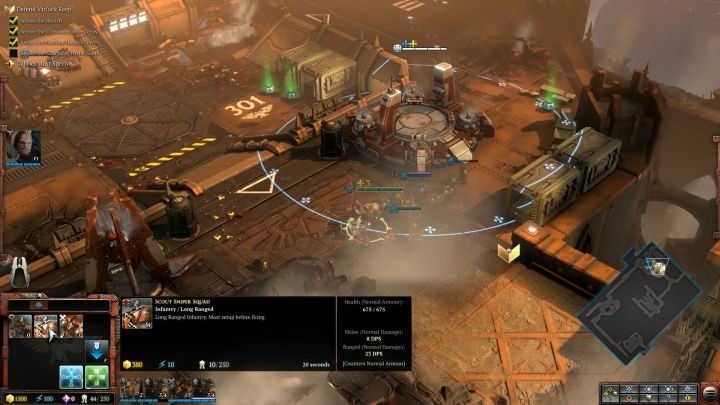 Connect Webways is another special ability like Relocate – available to all Eldar buildings aside from the generators and Listening Posts placed on resource points. This allows you to connect two different buildings and form a Webway. A Webway is basically a portal – sending unit to one of the connected buildings will teleport it to the location of the other one. This allows you to quickly move your units around the entire map. What is more, this ability can easily be linked with Relocate. 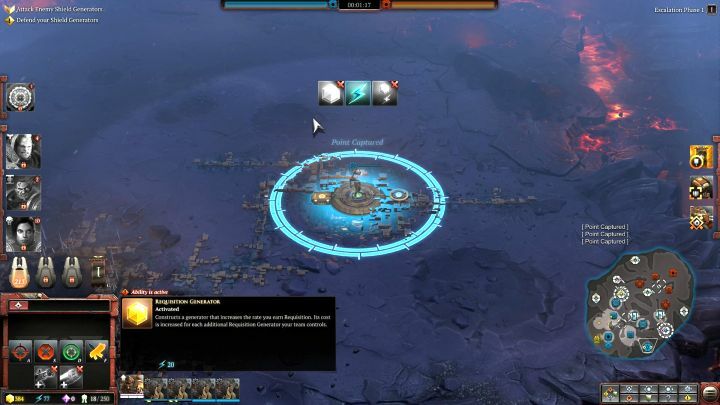 For instance, you can send one of your buildings to a distant location near the enemy base, use Connect Webways to connect it to a construction placed in your base and use the portal to send your units near the enemy base. This will allow you to move your units around the whole map without any costs and limitations. However, keep in mind that once you use Relocate, you must wait for a short while before the portal from the ability is available again. Additionally, using Connect Webways on a building that is already connected will overwrite the previous connection. The Eldritch Storm is the Eldar super ability. It allows the player to create a devastating storm at the specified location, dealing damage and slowing any enemies in the area. Additionally, the storm can be controlled, allowing you to chase after fleeing enemy units or to use it to simply break the enemy formation. The ability has a second “form”. The energy of the storm can be “given” to any unit (but you should always use an elite unit, as they are more durable than most regular units), turning it into a conduit. Once the process is complete, the conduit will absorb the storm, preventing it from dealing moderate area of effect damage and will start attacking random nearby units with powerful lightning bolts, capable of dealing tremendous damage. However, keep in mind that the enemy can either stun or kill the conduit unit – this will revert the storm back to its “destructive form”. There’s only one problem to the ability – it requires 2 elite points. Using the Eldritch Storm can save your skin, but it will also severely delay the moment at which you will be capable of calling more powerful elite units to the battlefield. Striking Scorpions is one of the best elite units in the game that can be deployed at the beginning of the game – 2 elite points can be accumulated in 6 minutes! They are extremely effective in melee combat and negate one of the biggest flaws of Eldars – the ineffectiveness of Dire Avengers when dealing with Ork Boyz. However, as with every cheap elite unit in the game, they quickly lose their effectiveness, which is why they should be used only in 1 on 1 matches, especially when you are against an Ork player. Ranger Ronahn is one of the worst elite units in the entire game. He can’t do much damage, his special abilities are very situational (not to mention that his teleport to stealth cover is completely useless in most games) and he is extremely vulnerable to enemy attacks. 3 elite points can be spent better – even the Strking Scorpions will be a better investment. Macha is one of the best elite units in the entire game – her low recruitment cost allows a player to deploy her relatively early and her effectiveness remains high during the whole game. During the early stage of the battle you will mostly be using her two offensive abilities known from the campaign – one allowing you to throw her spear, the other to detonate it, both decimating infantry units. Her effectiveness remains high during the entire match, mainly because of her third ability, allowing her to put multiple units into stasis, rendering them useless for the duration of the ability and creating confusion in the enemy ranks. Her doctrine is also very good – all elite units you deploy on the battlefield will be put into stasis and will regenerate a portion of their health instead of dying. This can happen once per elite unit (and is refreshed when the unit is deployed to the battlefield again), but it can save a dying unit, giving it a second chance. 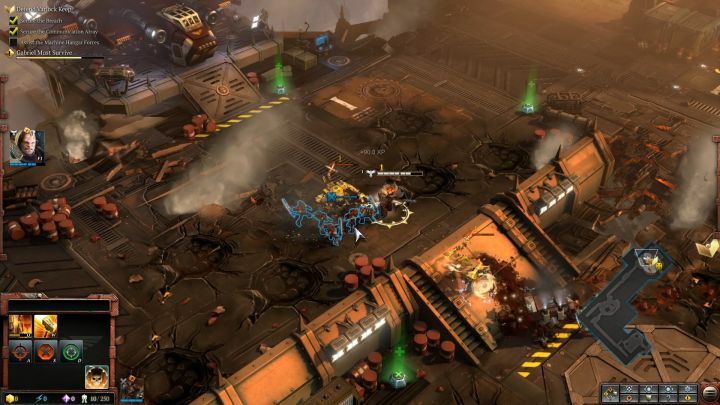 Warp Spiders is an elite unit that can create confusion in the enemy ranks. They attack from a short distance and deal quite high damage and all of their abilities allow them to teleport from one place to another. 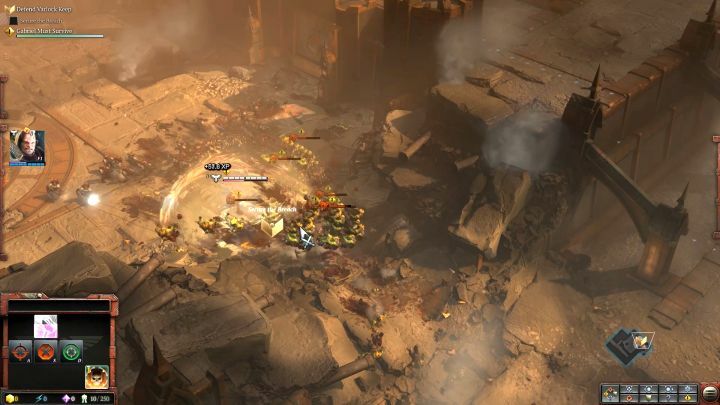 Their slowing mines ability is the highlight here – by using them, they can teleport to multiple places, placing special mines that will damage and slow nearby units. However, they need a tremendous amount of player’s attention to be useful on the battlefield – if you won’t use their abilities regularly and teleport them from one place to another, they won’t be much stronger than a regular ranged unit. Additionally, they cost 5 elite points. Another peculiar Eldar elite unit and also the only one in the entire game that you won’t be controlling or fighting against during the single player campaign. The only elite unit that works in “two modes” – normal, when Kyre is walking on the battlefield and flying, when Kyre is turned into a Skimmer. Unfortunately, mastering the use of this elite unit will take some time and his abilities aren’t good enough to justify the high (5 elite points) deployment cost. Wraithlord is, basically, the weaker version of Wraithknights. A large walker unit, with large health pool and capable of obliterating multiple enemy units on its own. However, this unit is completely not worth the cost, especially when compared to Wraithknights. It costs 7 elite points, whereas the most powerful Eldar units only 2 more (9). It’s better to just ignore it and go for one of the Wraithknights instead. The most expensive Eldar elite unit in the game. Wraithknight is a super-heavy walker, extremely effective at ranged combat, easily taking out multiple enemy units in seconds. Similarly to the other “version” of the unit (Taldeer), Wraithknight has an ability that allows it to jump to a specified position, dealing damage and knocking away all enemies in the area. You should use this (or the other type, Wraithknight Taldeer if you prefer melee combat) at your disposal. It costs a tremendous amount of elite points (9), but it’s well worth the effort. If you, however, prefer a unit fighting in melee range, you should invest in the one described below. An elite unit that players who finished the single player campaign will know about. Wraithknight Taldeer is probably the most powerful melee unit in the entire game – no other unit can defeat her and even other titan elite units won’t be able to keep up with her melee damage. What is more, she has one of the most overpowered abilities in the game, allowing her to set up a shield in the specified direction, absorbing all attacks and, at the end of the ability, generating a pulse that will put every unit standing there in stasis. Ork troops are extremely numerous. 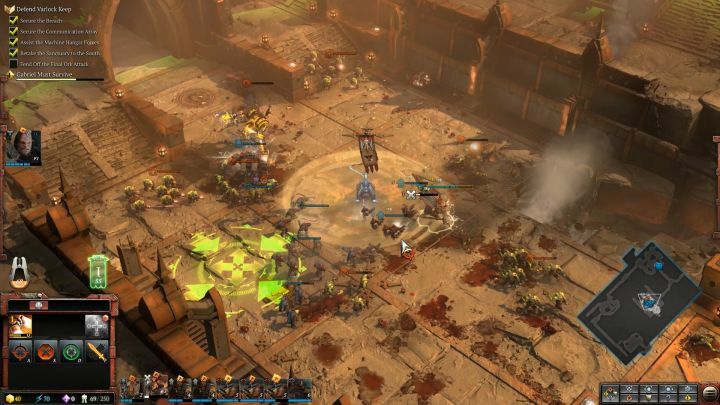 Orks in Warhammer 40,000: Dawn of War III are characterized by their extremely high numbers. This, however, comes at a price – their troops, especially the low-tier ones, are less durable than those of Space Marines and less mobile than the Eldar forces. Orks are very strong during the early game, mainly because of their starting infantry, Boyz, easy outperforming the starting units from the remaining factions. While playing as Orks, you must make use of four different faction mechanics: Scrap (and Loot), Salvage, Waaaagh! Towers and the Roks super ability. Scrap is, basically, an additional resource available only to the Ork faction. They use it in the process of Loot and Salvage. The first allows any Ork unit (aside from their builders, Gretchin) to collect Scrap and increase their combat capabilities. A unit equipped with this valuable resource can gain a new ability (or have one of the present ones enhanced), get a shield or receive additional charges that will allow it to use abilities and/or attacks more often. Loot is a thing that you should always remember about, as Ork units without Scrap are generally less effective than the units from other factions. Proper usage of this resource will allow you to increase the overall effectiveness of Ork units and elites and level the playing field. Scrap can be acquired from two different sources. The first one is a Waaagh! Tower. Those buildings generate Scrap each 30 seconds. The resource will fall to the ground, allowing your units to use it. With higher escalation phases, the amount and type of Scrap will also change – more on that can be found in the chapter about escalation phases. Also, scrap is left behind when enemy vehicles are destroyed. Each time an enemy vehicle is destroyed on the battlefield, Scrap will appear in its place. The size of the Scrap depends on the size of the machine – most will leave behind a medium sized one, but some will give you large ones. Salvage is the second method of using Scrap. 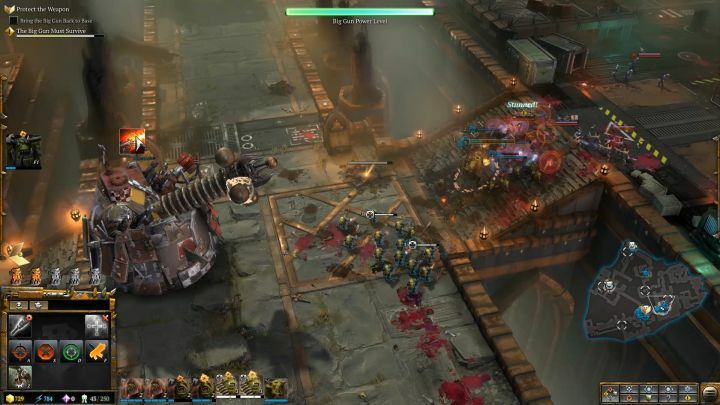 It allows the Ork builders, Gretchin, to use medium and large Salvages to construct any mechanical unit of this faction – Trukks, Deffkoptas, Killa Kans, Deff Dreads and Big Trakks. Units created with this method are cheaper than the ones produced through the production buildings. What is more, the production time is also significantly shorter and will take only a few seconds, whereas building the most expensive Ork units will require several times more time. There are, however, some drawbacks to this powerful mechanic. First things first, you still need buildings to unlock specific units (as well as the adequate amount of Waaagh! Towers) to be able to produce the unit. Secondly, the created unit won’t be at full health – in most cases it will have 3/4 of total health, but the amount can vary depending on the “health” of the Scrap. Waaagh! Towers are one of the buildings of the Orks, connected to the most important mechanic of this faction. First things first, Orks, unlike Eldars and Space Marines, can’t increase their tech level by upgrading the main building. Instead, they must build Waaagh! Towers. In order to get to the highest tech level, you must construct 5 of those. Fortunately, losing any of them won’t decrease your tech level – you just need to construct them once. Secondly, those towers are capable of generating Scrap. This is by far the easiest, safest and most efficient source of this valuable resource, especially if you want to equip your units with it. Waaagh! Towers also have access to a special ability called Waaaagh!. Once activated, a music will be heard from the tower, hyping nearby Ork units. After a short while, a battle cry will be emitted from the tower, increasing the attack speed and damage dealt of every allied Ork unit in the area around the building. Additionally, by having Gorgutz in your army, this ability will also heal (and replenish) some of the health of your injured units, allowing you to reinforce your troops for free. However, note that the enemy will be able to see your building on the mini-map while the Waaagh! is active and that the building will receive additional damage for the duration of the ability. Finally, let’s talk about an equally important aspect of this building – their defensive capabilities. Waaagh! Towers are equipped with turrets, making them extremely effective at protecting resource points – together with Listening Posts, they should be able to take out small groups of enemies on their own. This is also the only defensive structure in the entire game – Listening Posts can only be placed on top of resource points, whereas Waaagh! Towers can be built anywhere. 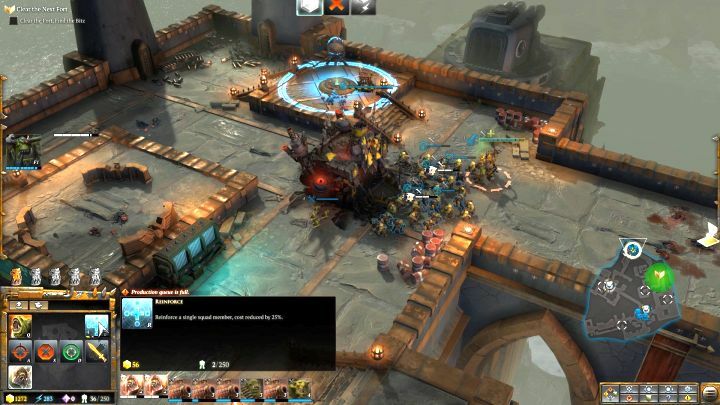 Roks is the super ability of the Ork faction. Once activated, it sends a tractor beam to the specified place. It will constantly deal damage and slow down units located around it. Additionally, it will simultaneously increase the area of effect as the ability goes on – this is represented by a progress bar. Once the mentioned progress bar is filled, a huge rock will fall on the battlefield, dealing immense damage to all enemies in the area. This is the most difficult super ability to control, but it’s capable of dealing the highest damage. It’s easy to run away from the strike zone, which is why you should always use a handy trick. The tractor beam can be picked up by allies and enemies. Use a durable and mobile unit, such as Gorgutz, for the task, pick up the item and order Gorgutz to run into the center of the enemy army and allow the rock to fall there. Picking and dropping the tractor beam is trivial – you just need to send a unit to interact with the object. Ork elite unit selection screen. Like with the Space Marines and Eldars, there are 9 elite units that an Ork commander can choose from. Those are: Stormboyz, Weirdboy Zappnoggin, Da Kommando, Gorgutz, Big Mek Wazmakka, Meganobz, Mad Dredd, Gorkanaut and Beauty Da Morkanaut. Probably the worst elite unit in the entire game. Stormboyz are a tempting choice, as they cost only 2 elite points, allowing a player to summon them after 6 minutes of game, but they are effective only during the first 10-15 minutes. Their effectiveness drops extremely quickly – when there are more enemy units (5+) deployed on the battlefield, they become virtually useless and the player is left with a unit that wastes a precious elite slot. Avoid them at all costs, there are better Ork elite units to choose from. Weirdboy Zappnoggin is similar to the Stormboyz elite unit, but his effectiveness won’t drop so suddenly. This unit is extremely useful when harassing enemy forces, especially during the first 15-20 minutes of the game. His abilities allow him to teleport over long distances and take out a single enemy unit in seconds. However, once those abilities have been used and are on cooldown, Weirdboy Zappnoggin’s effectiveness drops to that of a cheapest unit, rendering him, basically, useless. If you know that you will be able to exploit his abilities to their fullest potential and jump around the whole map harassing enemies, you should choose this elite unit. Otherwise, you can simply ignore Weirdboy Zappnoggin and choose a different elite unit – Orks are the most effective during the early game and you can manage even without a single elite unit deployed on the battlefield. Da Kommando is one of the best elite units that can be deployed early in the game. He costs only 3 elite points and allows a capable player to make the enemy’s life a misery, especially during one on one games. Da Kommando can deal immense damage in close combat – he is capable of taking out an entire unit with only two shots. What is more, he can lay mines and become invisible (camouflaged), making him hard to catch and take out. He is extremely effective at taking out and capturing enemy resource points – the enemy has to send at least several units to be able to stop this elite unit. His effectiveness drops after 15-20 minutes of the game, but it’s still worth to invest those 3 points into Da Kommando, as he is second to none when it comes to early game presence. Gorgutz is the Ork elite unit that almost every player will know about – this is the first unit that you will be controlling during the Ork campaign, as well as one of the elite units unlocked from the very beginning. This is also one of the best elite units in the entire game, mainly because of his special abilities. One of them, Grapplin’ Klaw, allows him to jump towards the target, dealing damage to everyone in a small area and taunting them, forcing those units to attack Gorgutz. This is extremely lethal when used against deployable units, such as Devastators with Bolters and Snipers, as well as all ranged units in the game. What is more, by using this ability Gorgutz can drag units from under heavy cover. The second ability, Spinnin’ Klaw, allows him to create a shield around himself, protecting every ally unit underneath it from ranged attacks. Additionally, Spinnin’ Klaw will deal damage to any enemy unit in the area. Gorgutz costs 4 elite points and his presence in your roster is almost mandatory, regardless of your gameplay preferences. What makes him even more effective is the fact that he is one of the most durable units in the entire game, second only to some of the most expensive (7-10 elite points) elite units. Another Ork elite unit that costs 4 elite points and another one whose effectiveness depends solely on the skill of the player. He can use multiple useful and deadly abilities, but they require a lot of attention and clicking to be fully effective. If you are a player that can move an entire army and simultaneously order Wazmakka around, you should give it a try. Otherwise, you should just look for a better unit. One of the more expensive Ork elite units, as they cost 6 elite points, but at the same time well worth the investment. Meganobz are the heavily-armored Ork infantry, capable of withstanding an absurd amount of punishment before the enemy can take them out. By collecting Scrap they gain charges that can be used to fire rockets, powerful enough to pierce through even the thickest armor. 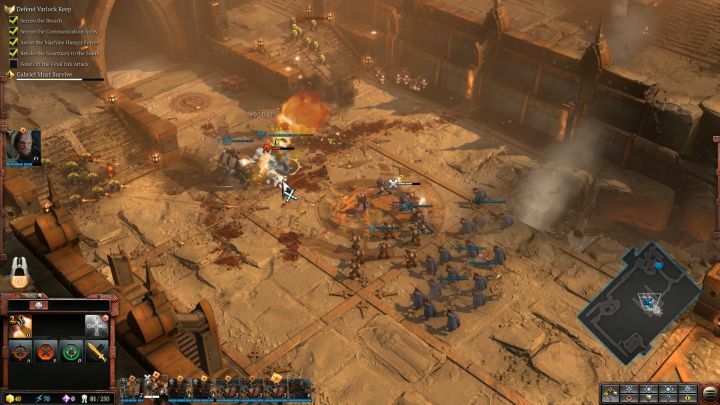 They can also create an electrical wall, slowing down enemy units and boosting the speed of allied troops – perfect when preparing to rush an opponent’s army. 6 elite points is a good price for this unit. Coupled with Gorgutz, this will allow your army to easily reach the enemy forces before they can even react. Another unit that looks promising, at least in theory. A powerful walker unit that is extraordinarily powerful in melee and whose special ability can dig a tunnel, allowing your units to easily move from point A to point B. However, the biggest flaw of this elite unit is its price – 7 elite points is too much for it, as the Ork titan units, Gorkolos and Morkolos, cost only 2 more and are significantly more effective. It’s definitely not worth the investment. Gorkanaut is one of the Ork titan units, specialized in ranged combat. He is capable of devastating the entire enemy army consisting of numerous and rather weak units (such as most infantry in the game), as well as taking out heavily-armored targets with ease. The special abilities of this super-heavy walker are what’s most threatening about it. The first allows him to fire a barrage of projectiles, severely injuring the target, whereas the second one lets him drop a huge rock (similar to the one from the Roks super ability) onto the battlefield. The latter one can take out most enemies in the game with a single shot – only the titans and the enemy core will survive the impact. However, those abilities have a huge flaw – an very long cooldown time. This makes Gotkanaut extremely effective as a unit capable of exterminating enemy units in seconds – if that’s what you’re looking for, you should give him a try. Also note that units can reinforce when near Gotkanaut. An elite unit you will be controlling during the Ork campaign. Without a doubt the most durable unit in the entire game. 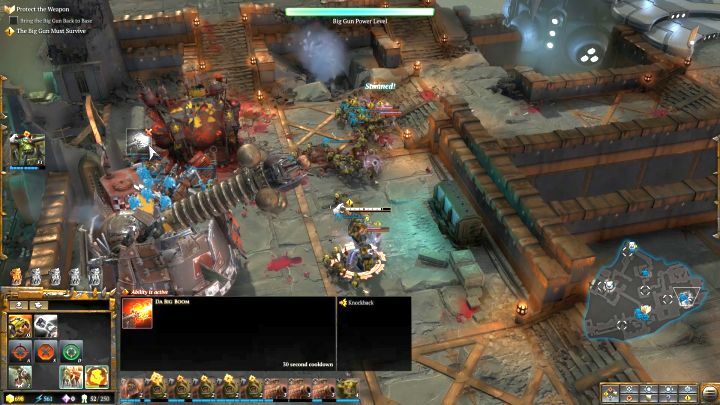 Not only it has an absurdly high health pool, it can use an ability that can absorb all incoming damage and one that can summon up to four Ork builders, Gretchin, to repair Morkanaut. Beauty is a slow-moving super-heavy walker unit that is almost impossible to stop. Additionally, one of its abilities allows this elite unit to launch a huge fist, dealing damage and stunning enemies. What is more, the ability can then be reactivated, retracting the fist back to Beauty, dragging all units (both allies and enemies) towards the walker. This makes this unit extremely effective at crowd control – every player will start panicking when all of his ranged units are suddenly dragged into the middle of enemy army.